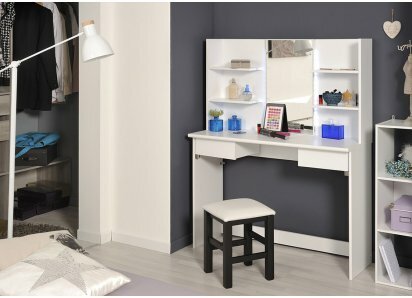 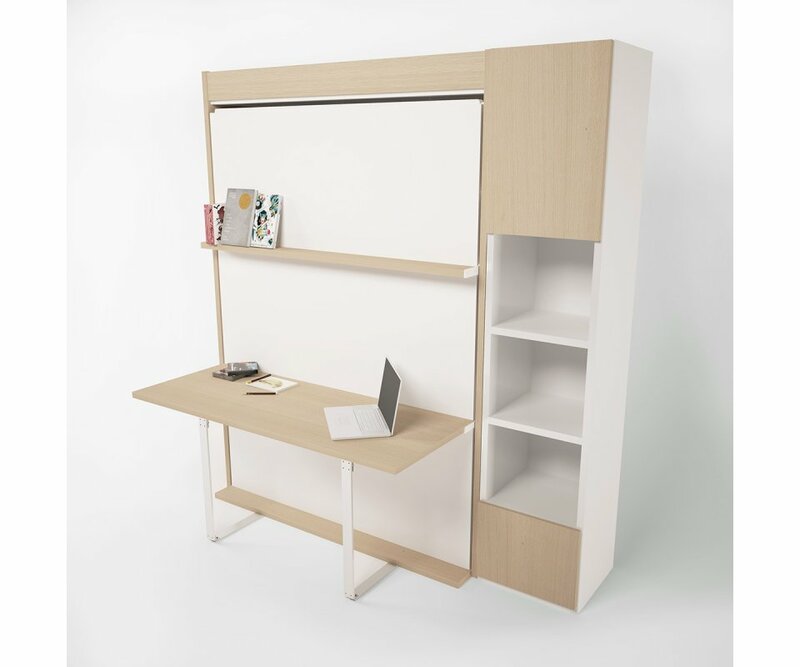 SPACE-SAVING BENEFIT: In less than 6 ft. of floor space, you have a desk area, shelf display and storage for a queen-size bed for you or for a guestroom! 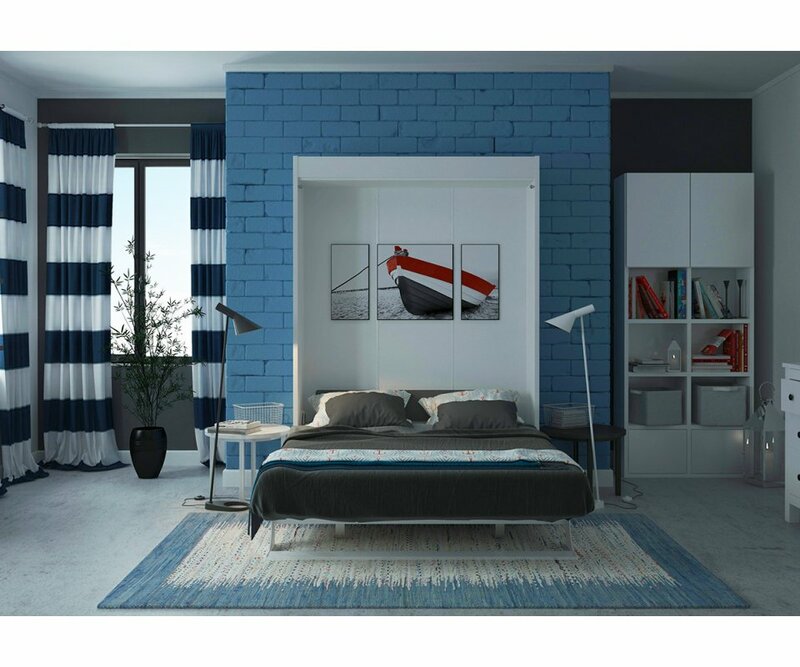 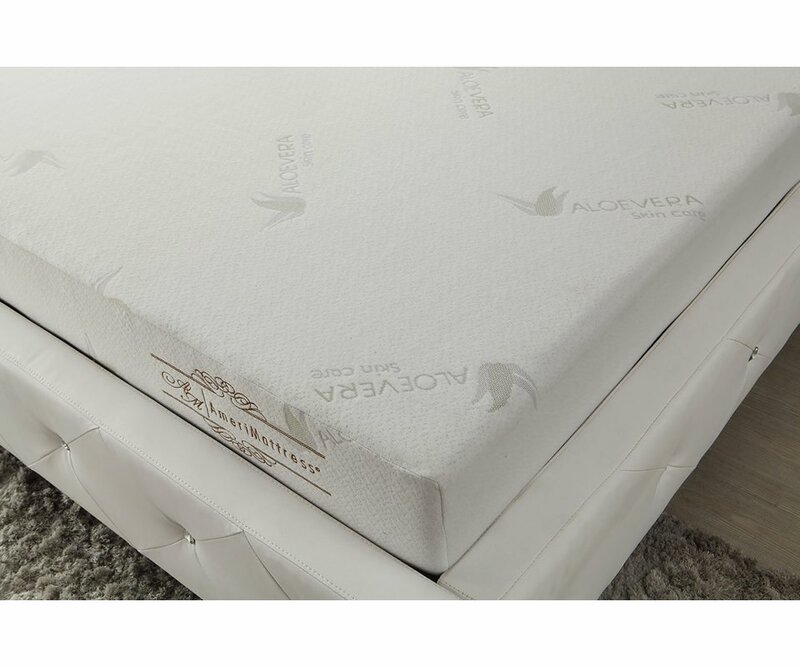 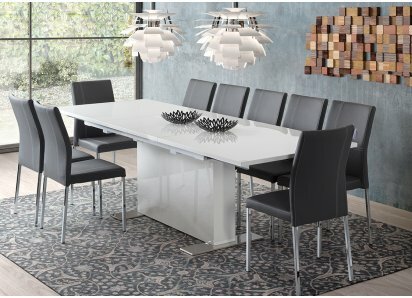 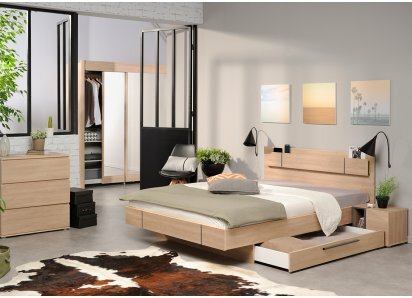 SUPERIOR QUALITY: Made from thick, E-1 Certified, high-gloss laminated chipboard, with heavy-duty hardware, strong aluminum frame and solid wood slats, so you can enjoy your wall bed for many years! 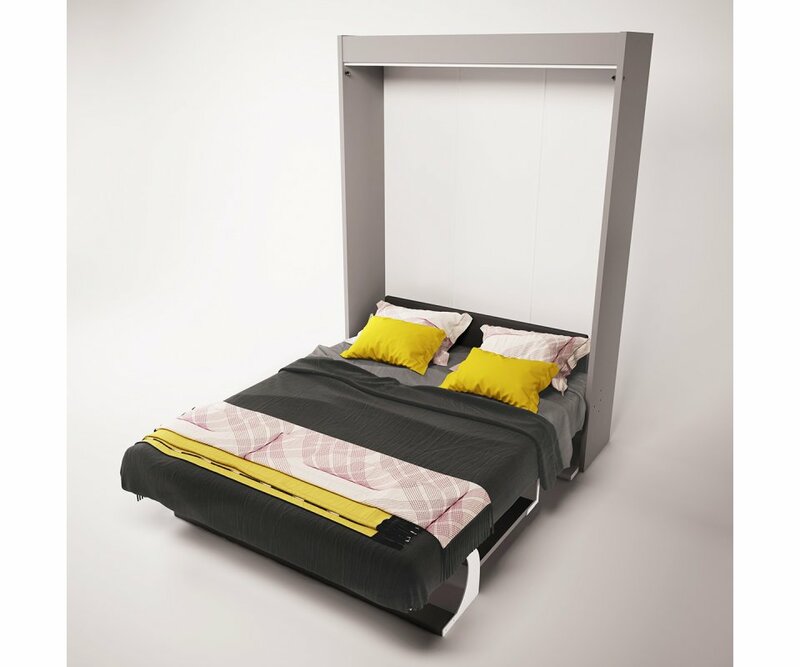 EASY OPEN/CLOSE MECHANISM: New generation gas shocks allow you to open and close the bed with just one hand! 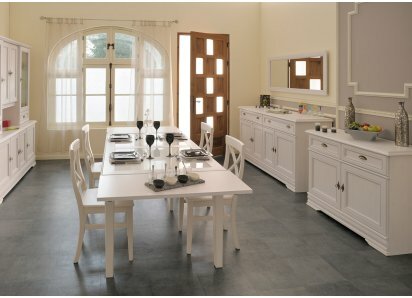 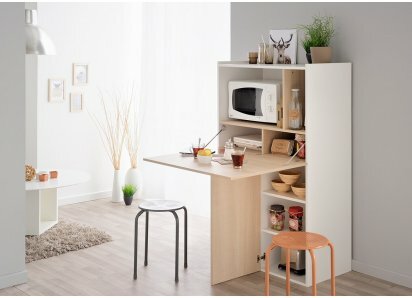 Do you need to find room in your small living space for guests? 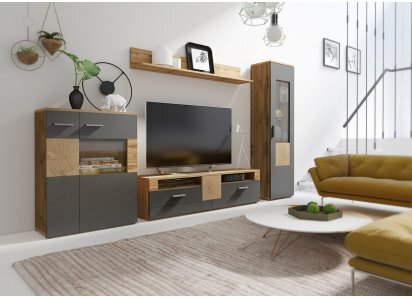 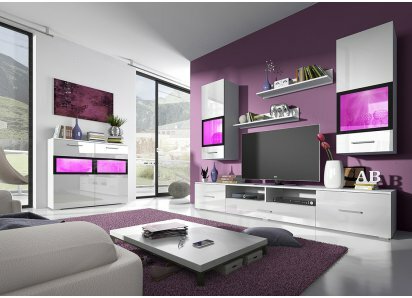 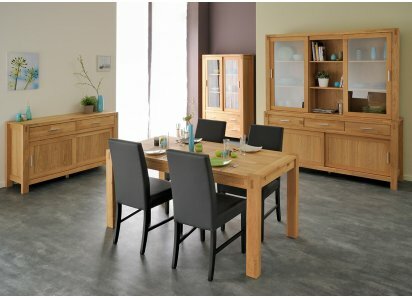 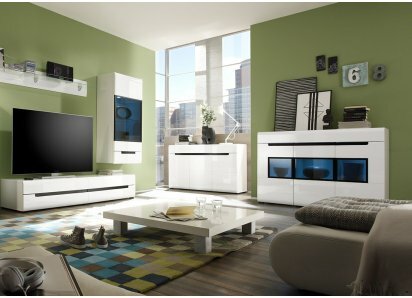 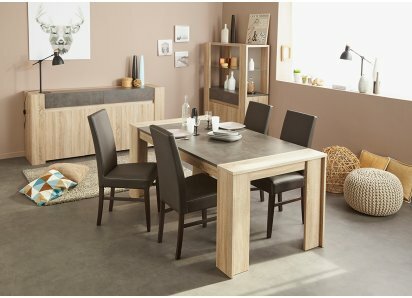 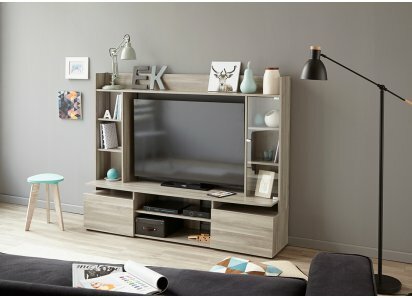 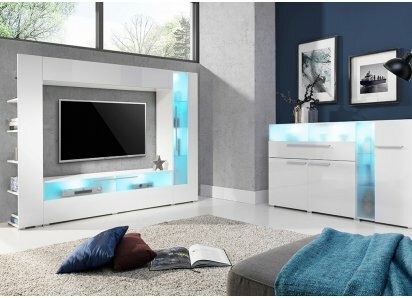 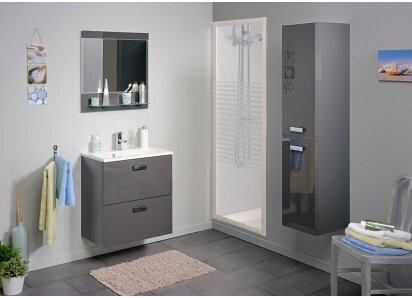 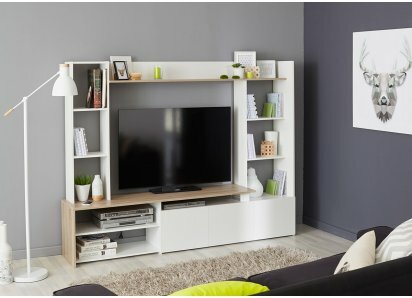 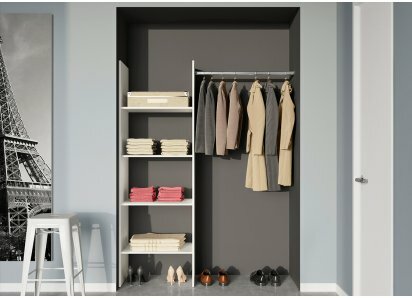 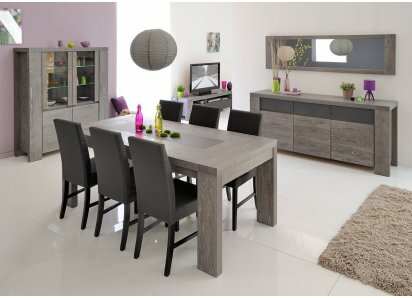 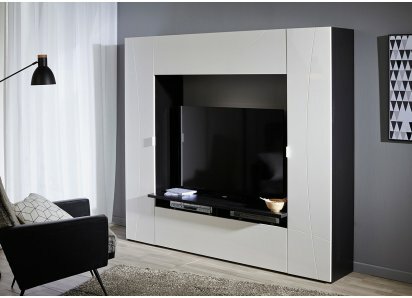 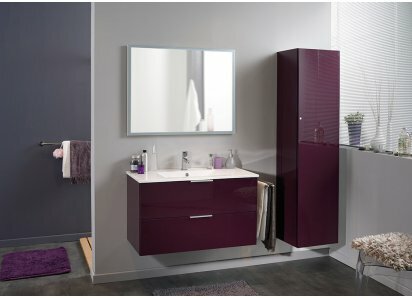 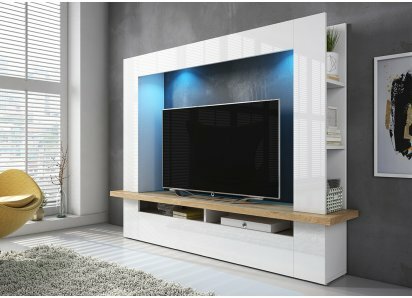 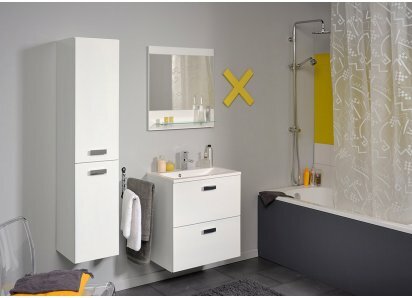 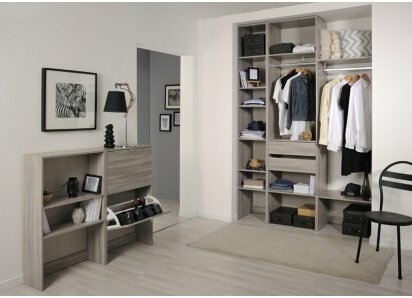 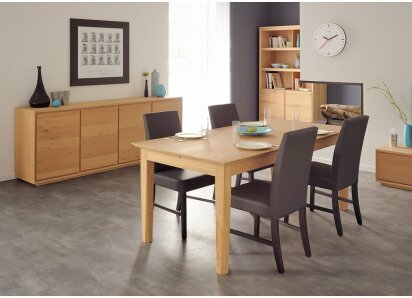 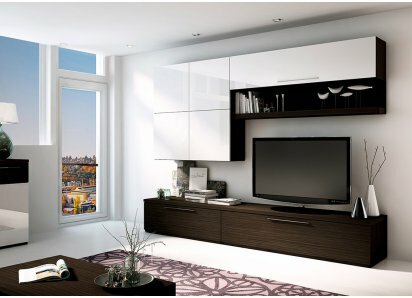 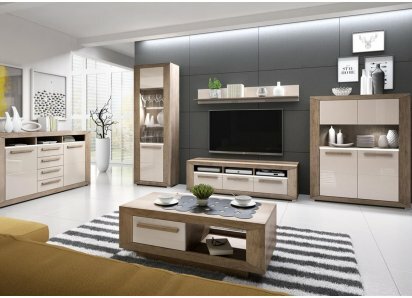 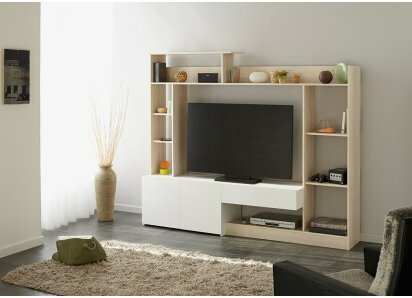 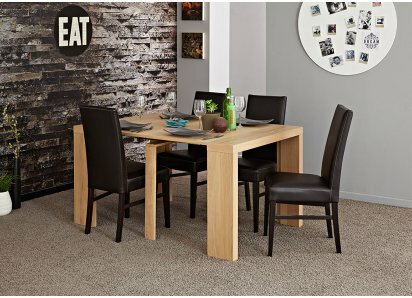 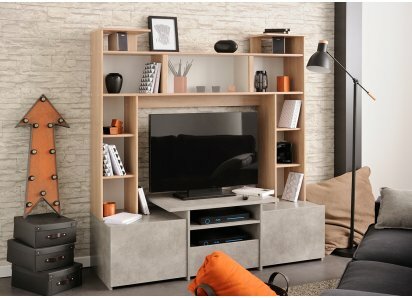 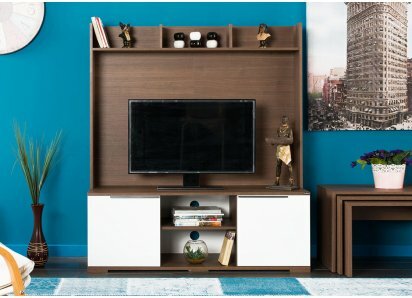 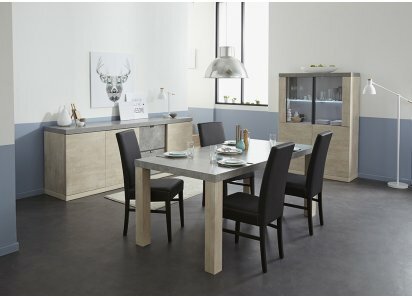 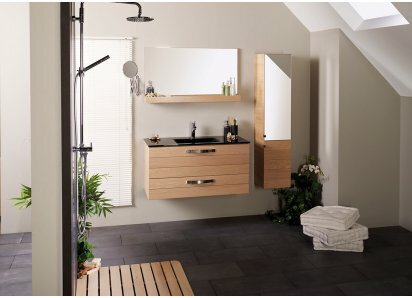 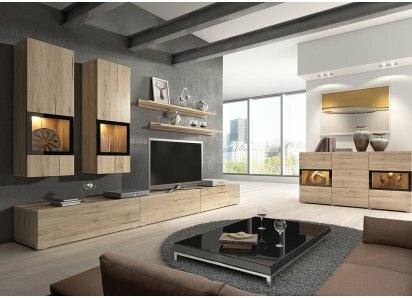 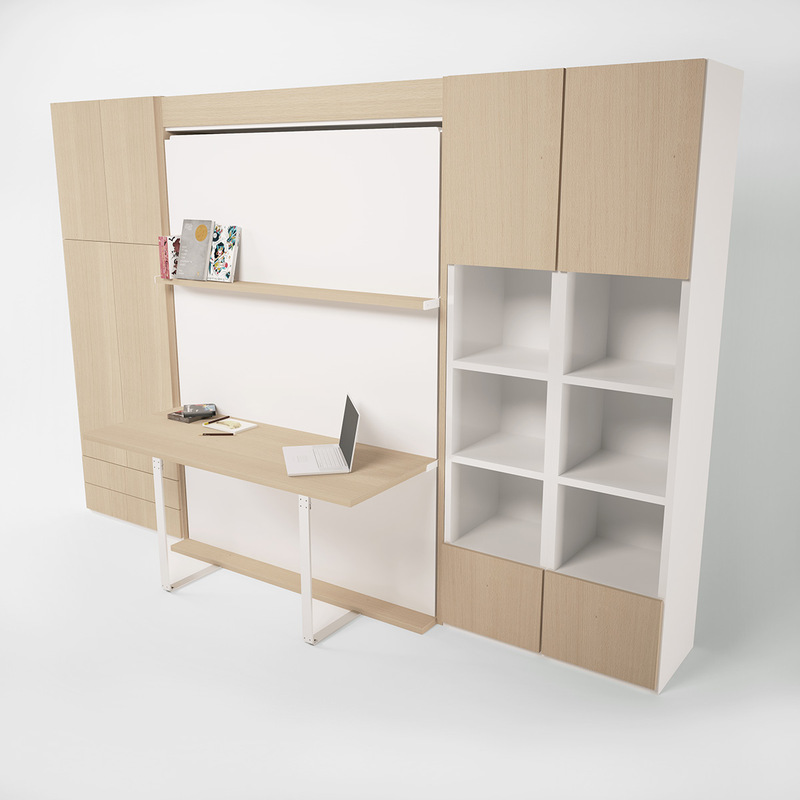 How would you like to save space and add extra storage at the same time? 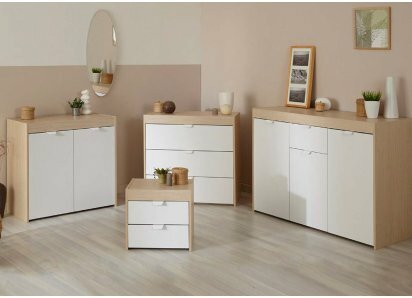 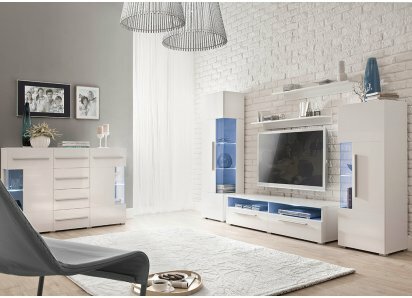 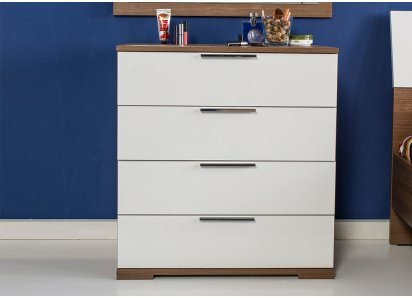 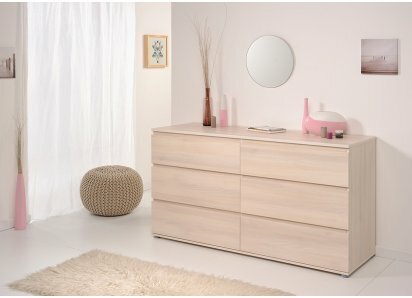 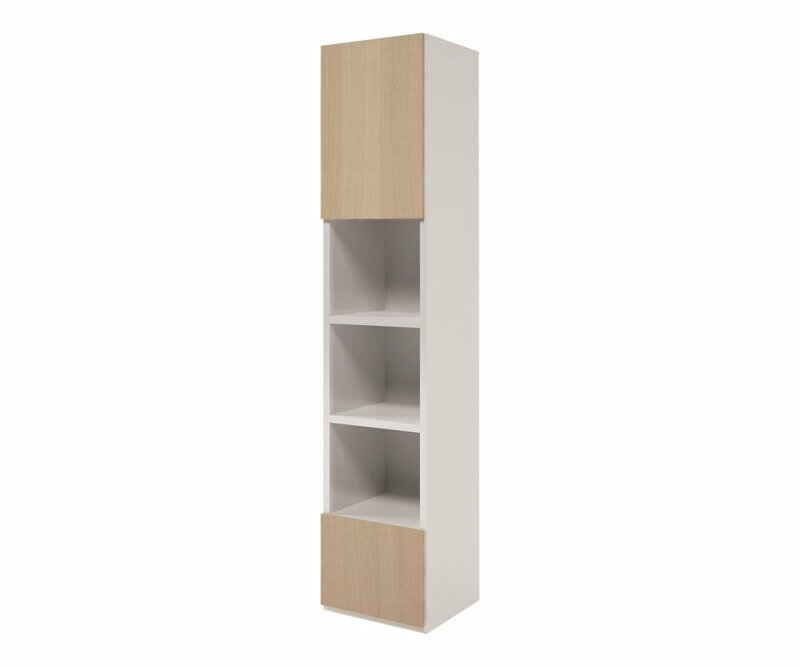 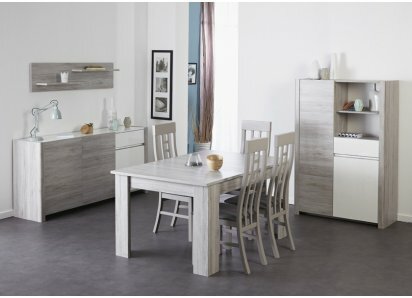 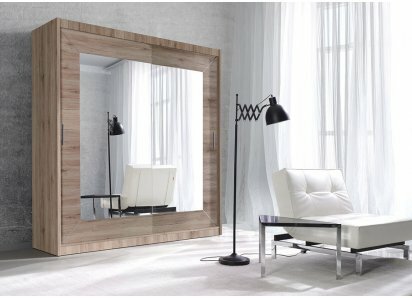 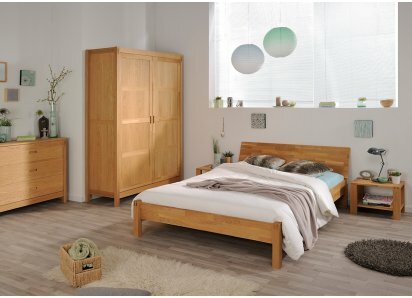 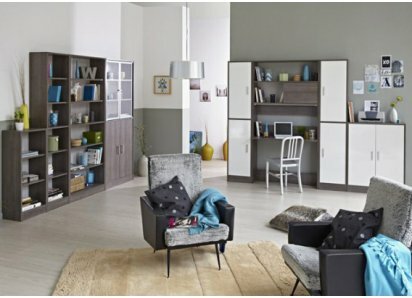 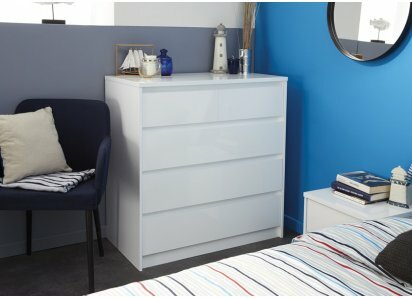 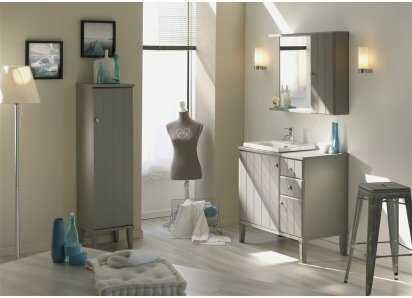 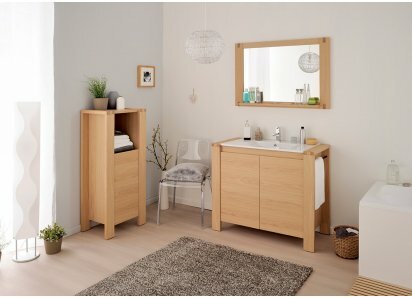 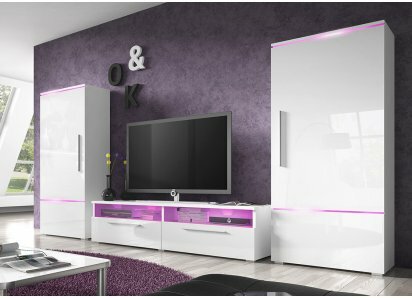 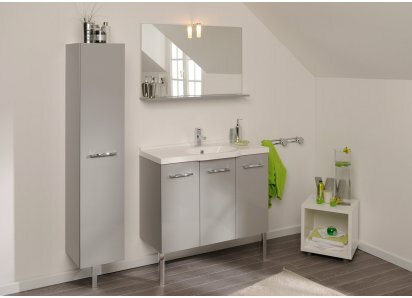 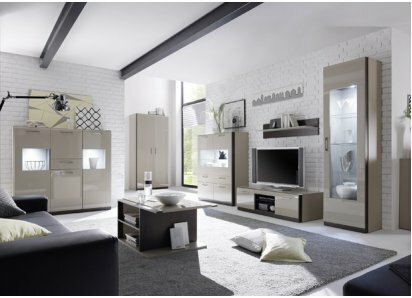 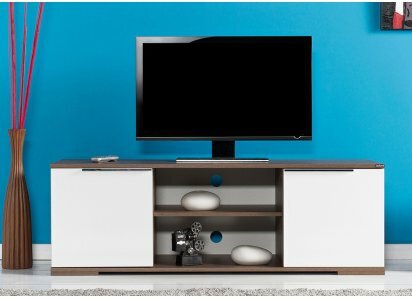 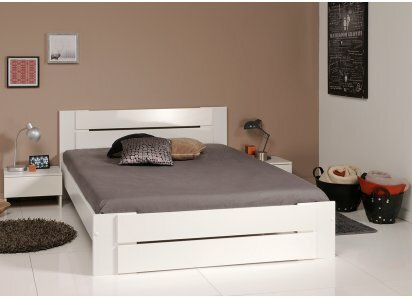 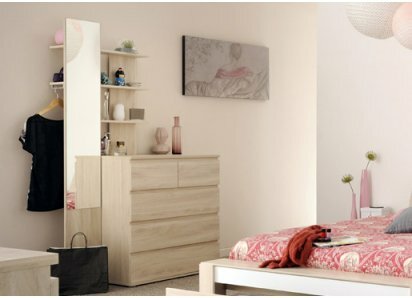 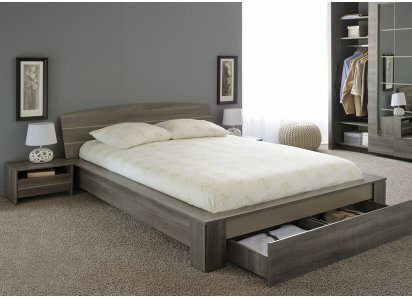 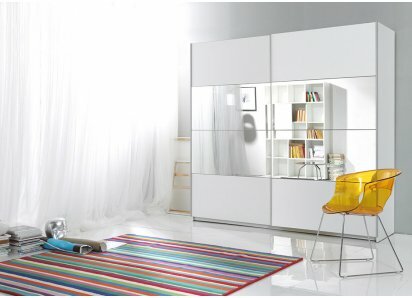 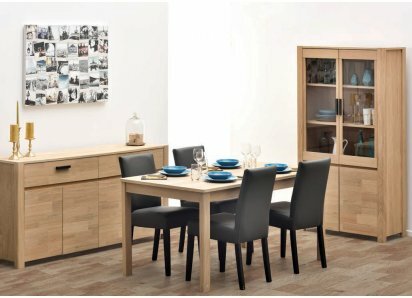 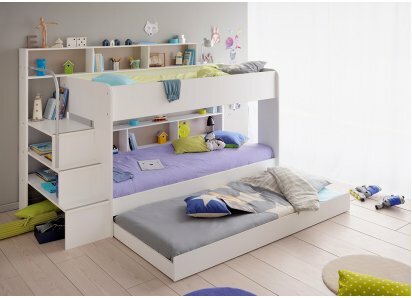 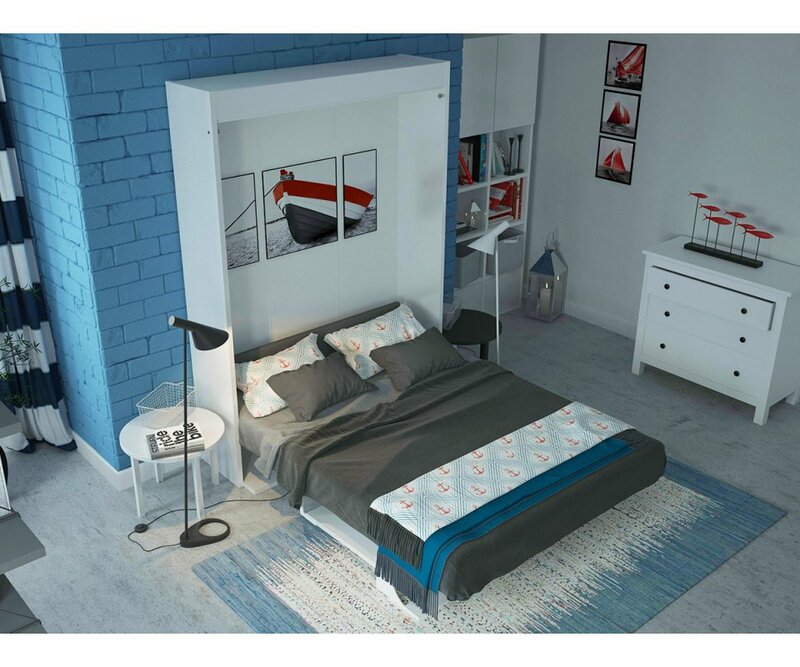 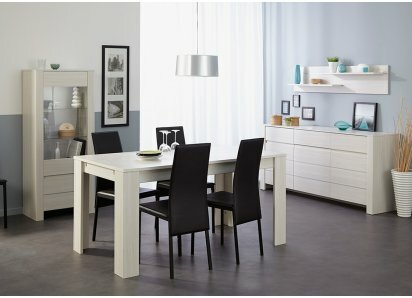 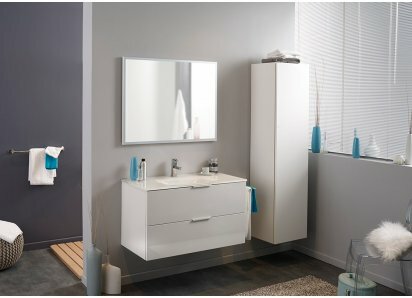 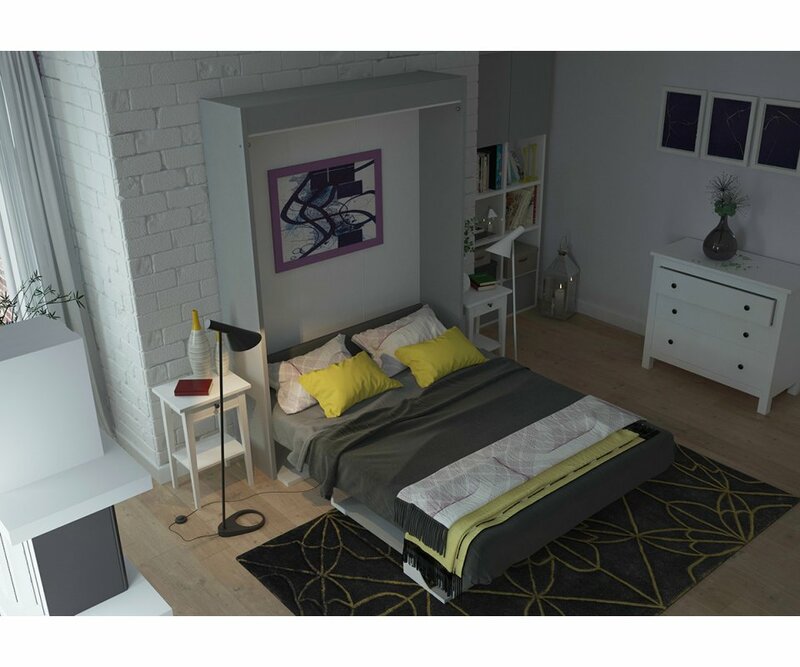 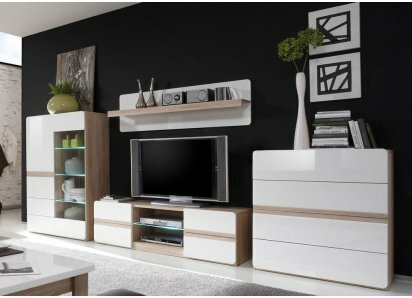 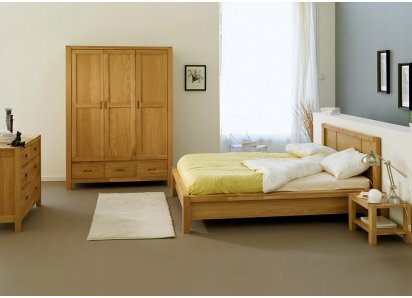 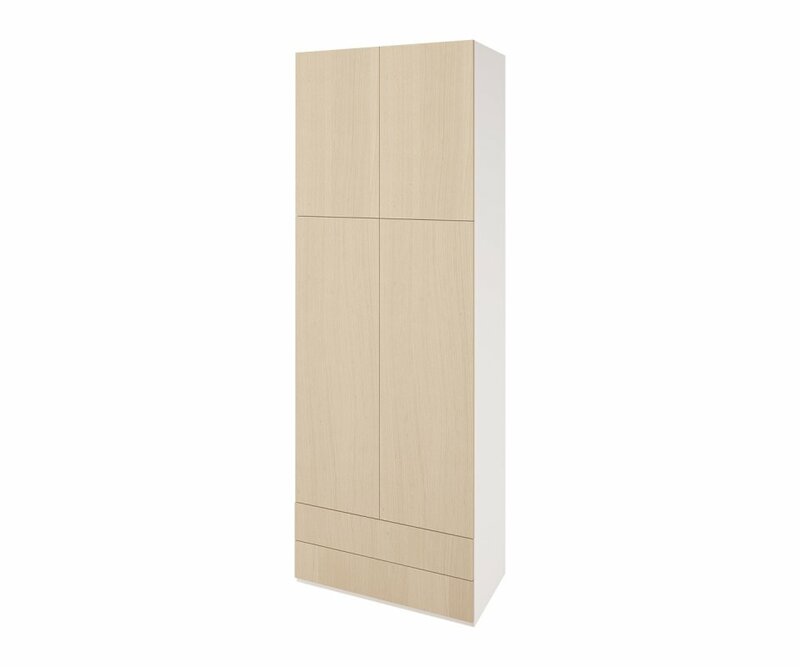 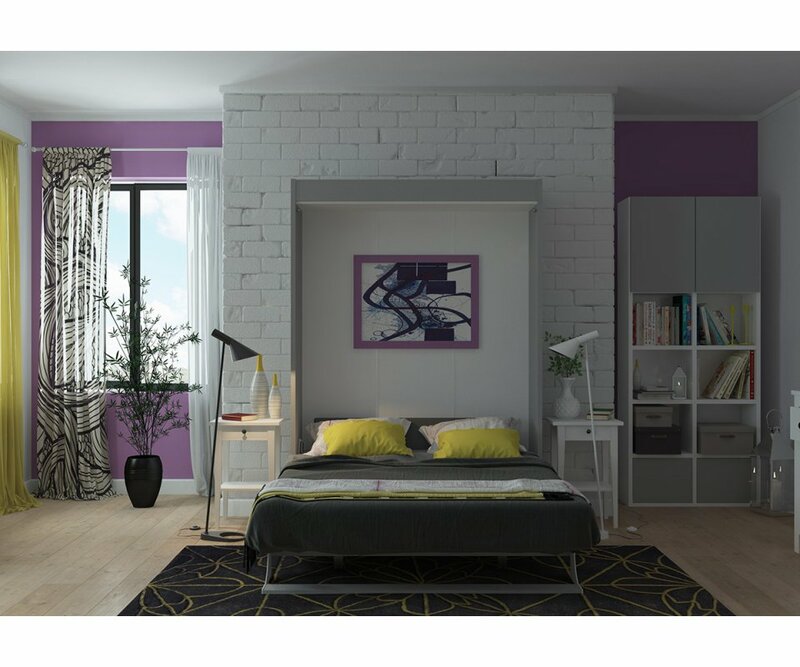 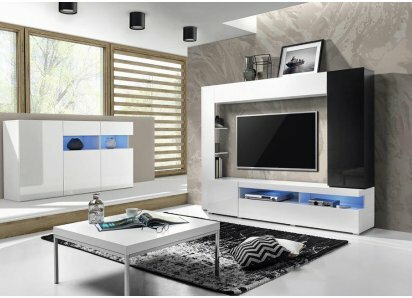 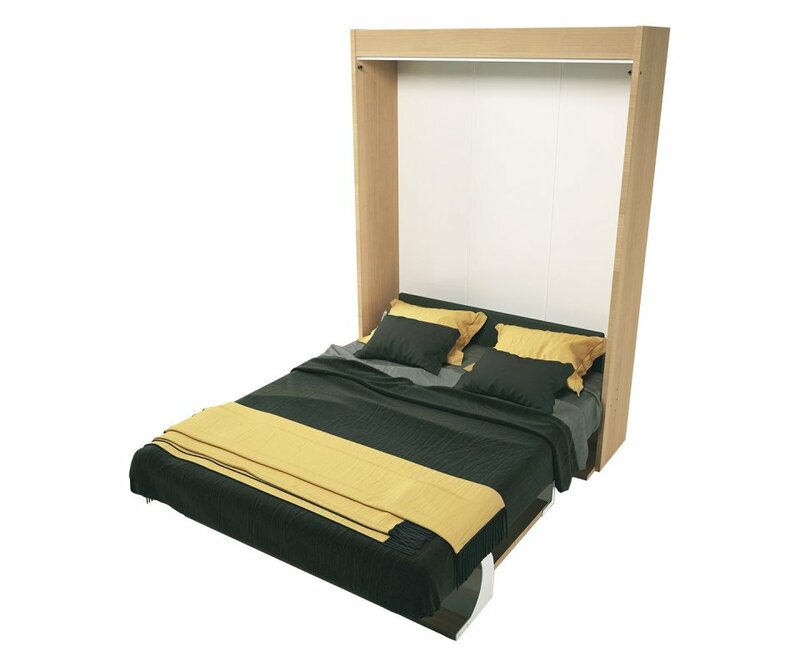 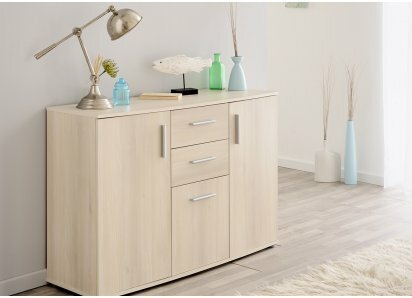 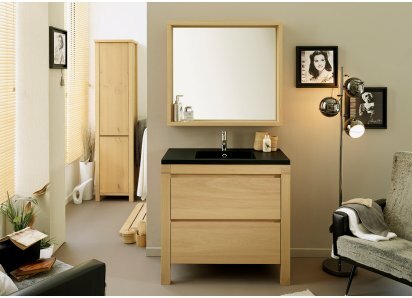 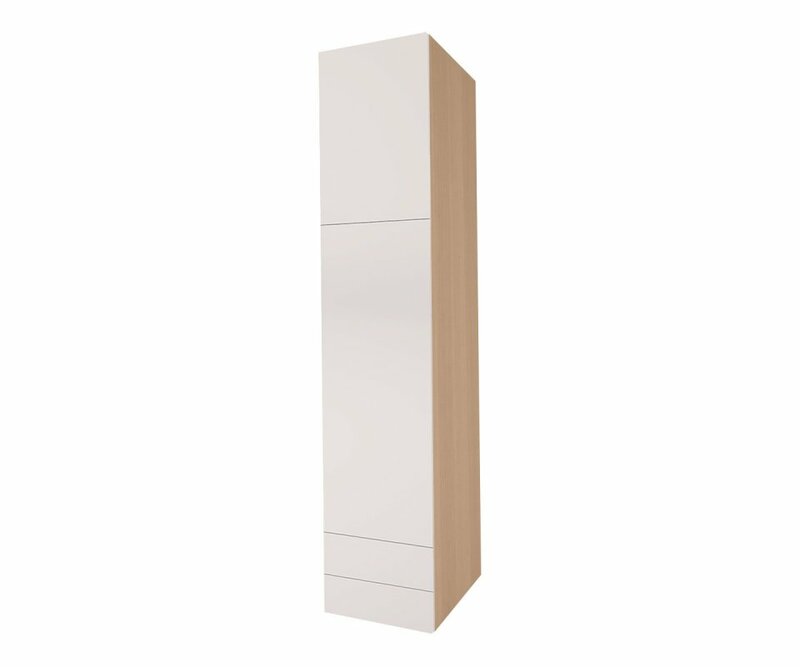 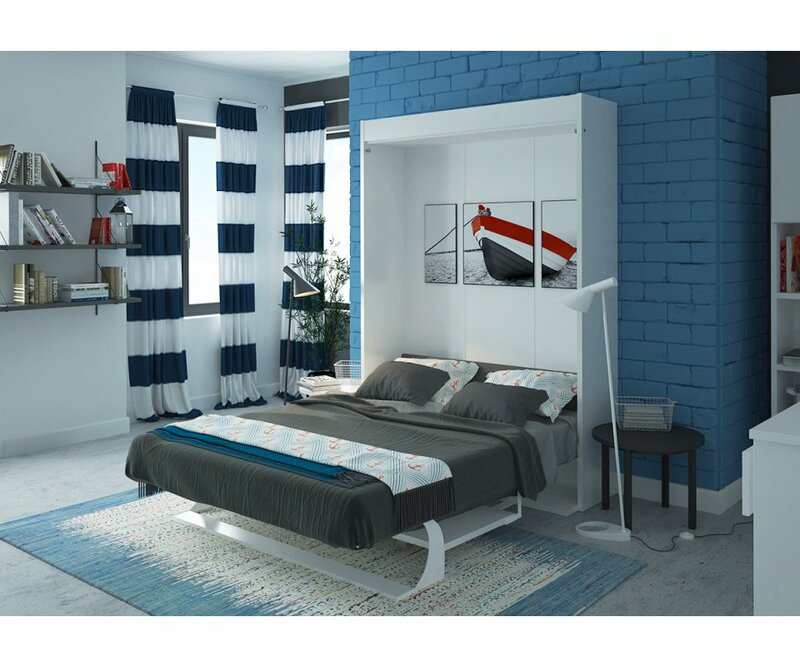 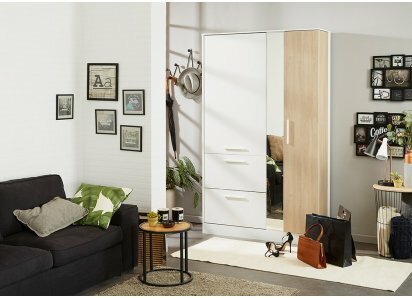 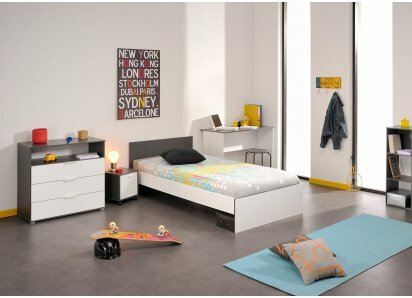 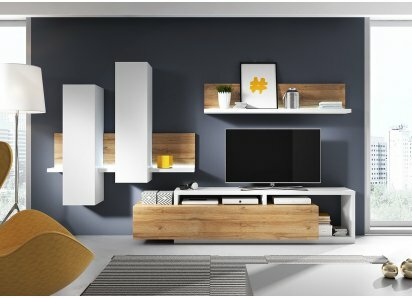 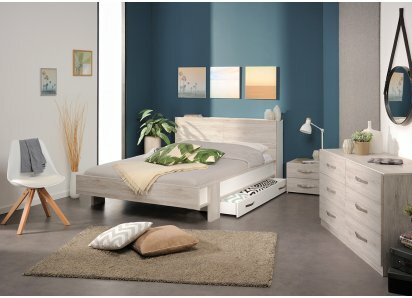 Our Multimo Bellezza A203-T style wall bed is an attractive addition to your room, with a cabinet in high-gloss white or light, natural woodgrain. 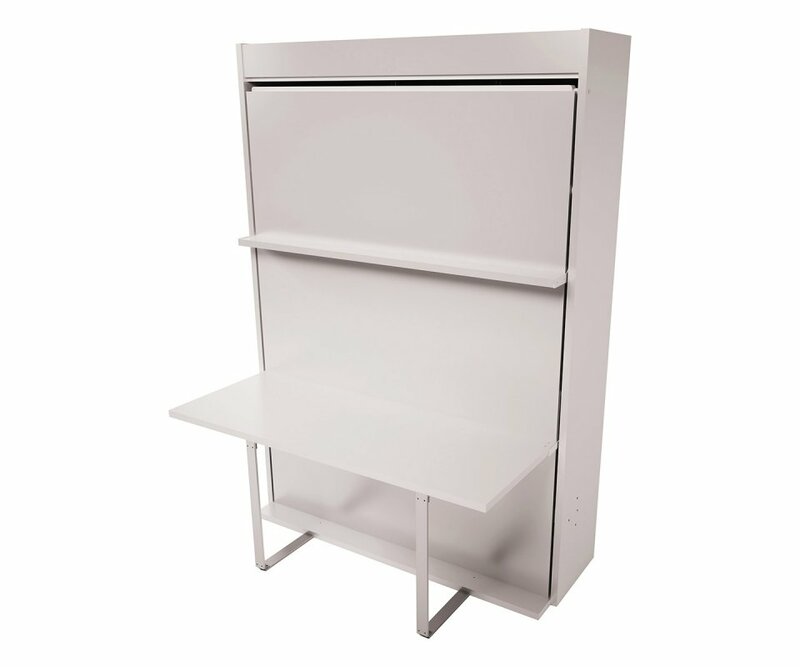 The cabinet has a narrow shelf, as well as the top of the cabinet, for displaying your collectibles, plants, books, and more. 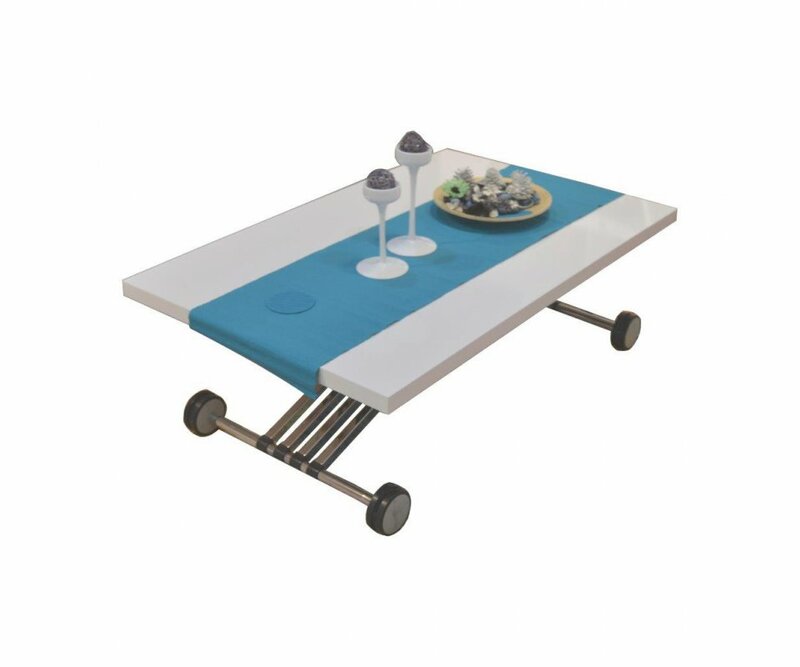 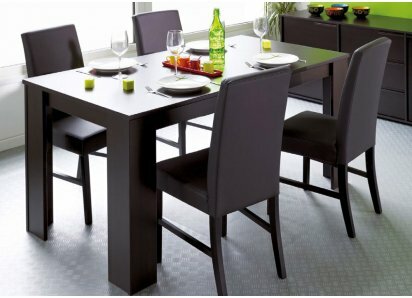 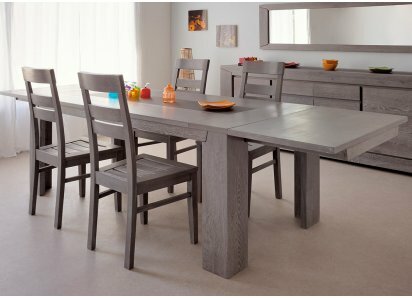 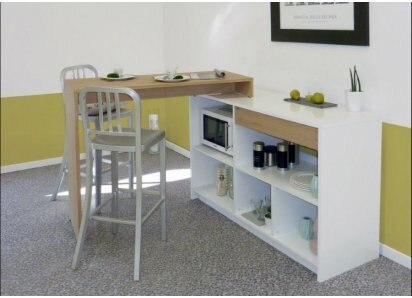 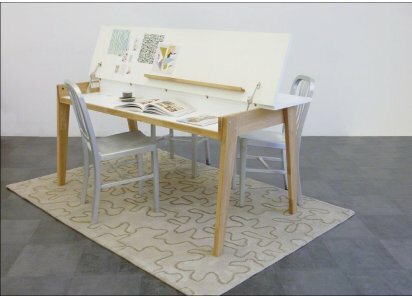 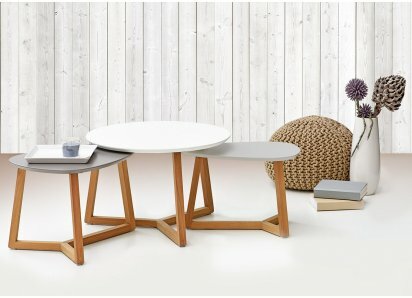 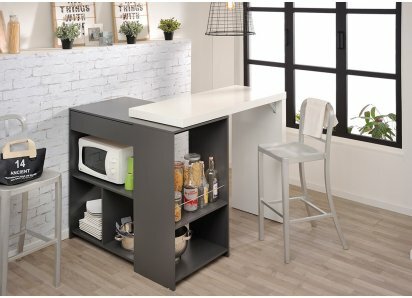 There’s a table/desk counter that is perfect for studying, using your laptop, eating meals, or crafting! 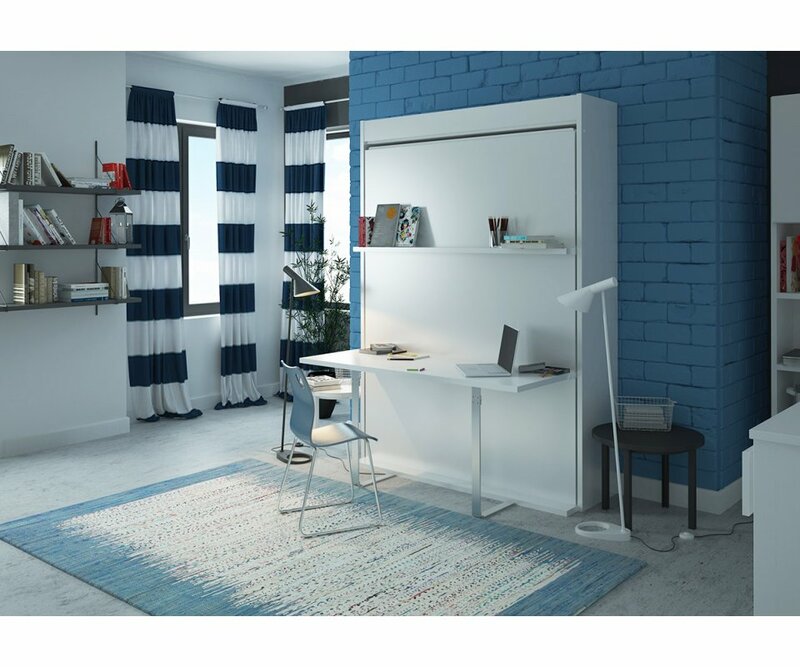 It takes just 17 ½”x64 ½” of floor space, and can even be used as a free-standing wall. 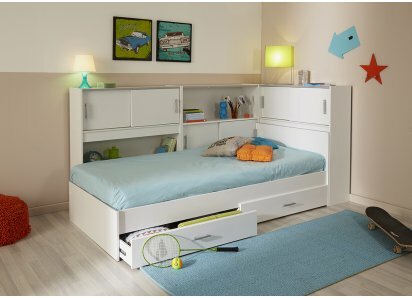 When guests come to visit, you can unfold a roomy queen-size bed, with mattress and pillow guards to hold everything in place! 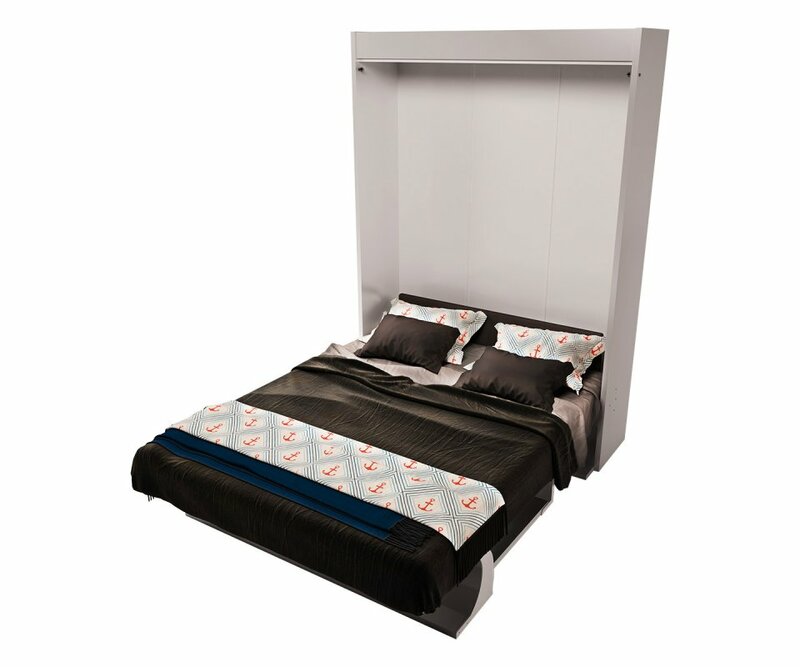 The ergonomic new generation gas shocks make opening and closing the bed a one-hand operation! 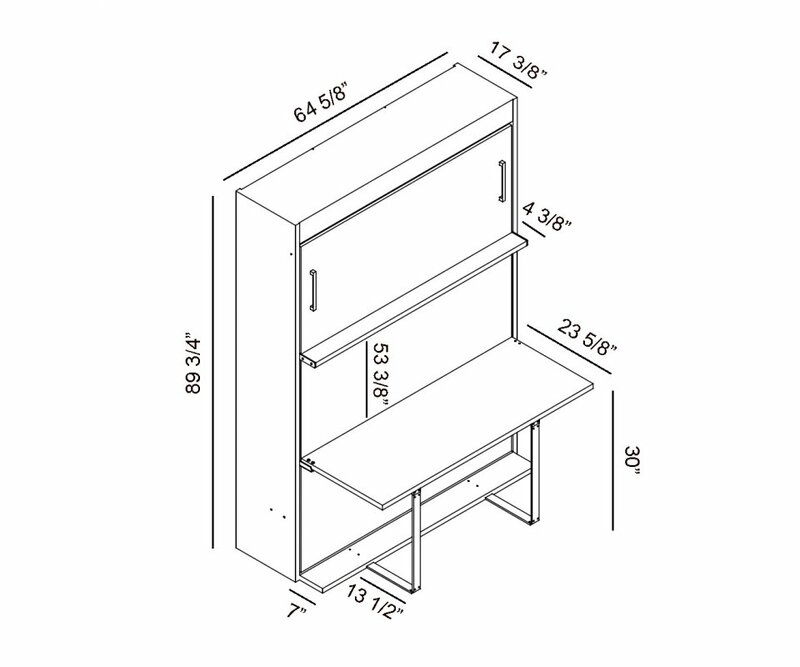 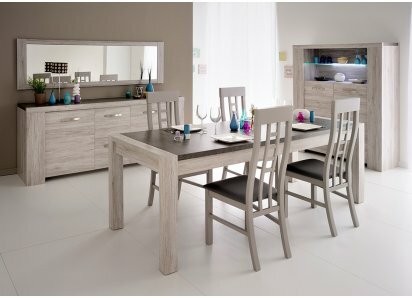 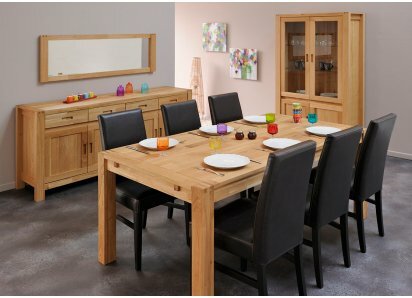 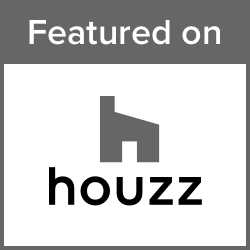 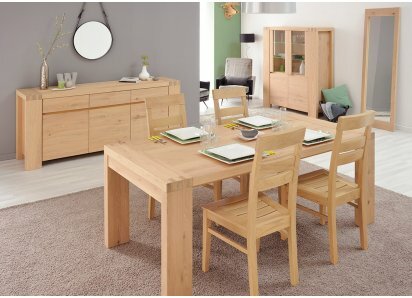 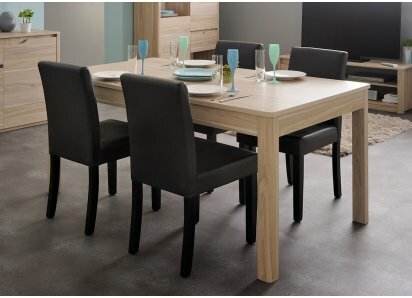 Your guests will be thrilled to have a comfortable place to sleep, with firm support from the heavy-duty aluminum frame and solid wood slats, and you’ll be thrilled with the solid construction and durable long life of your cabinet! 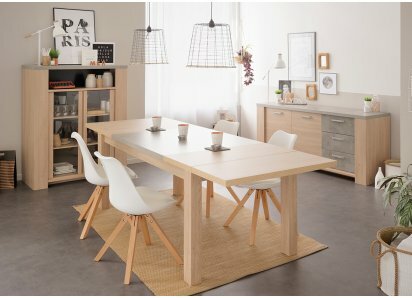 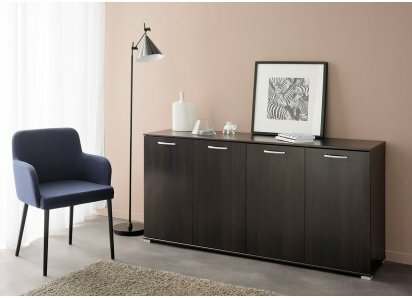 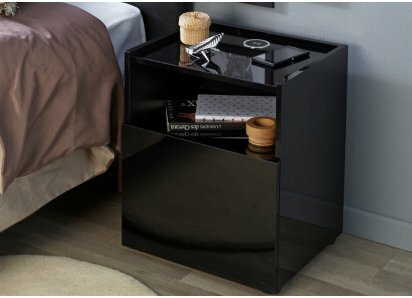 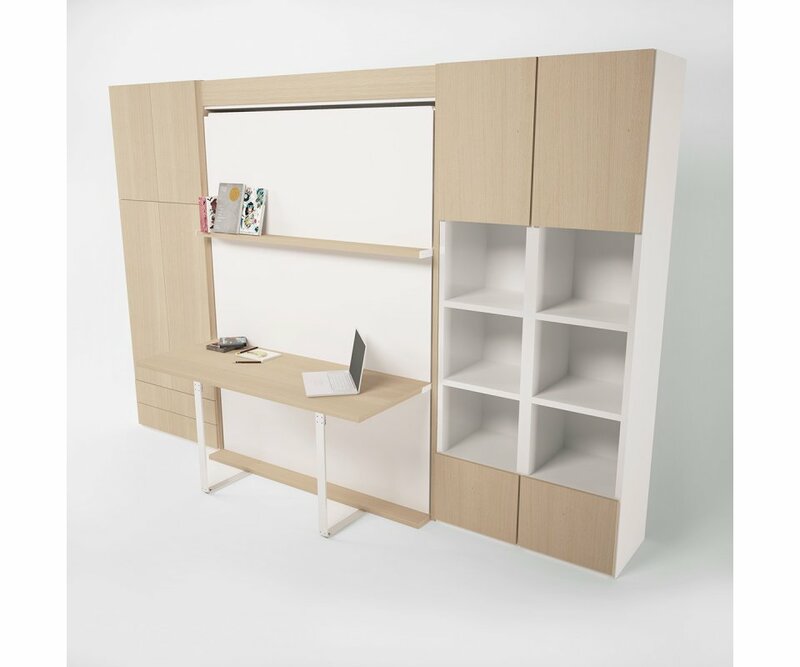 Bring space-saving organization and style to your office or living room, and add a guestroom, too! 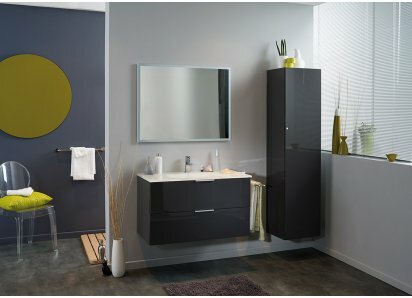 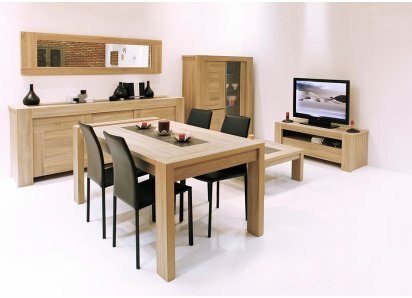 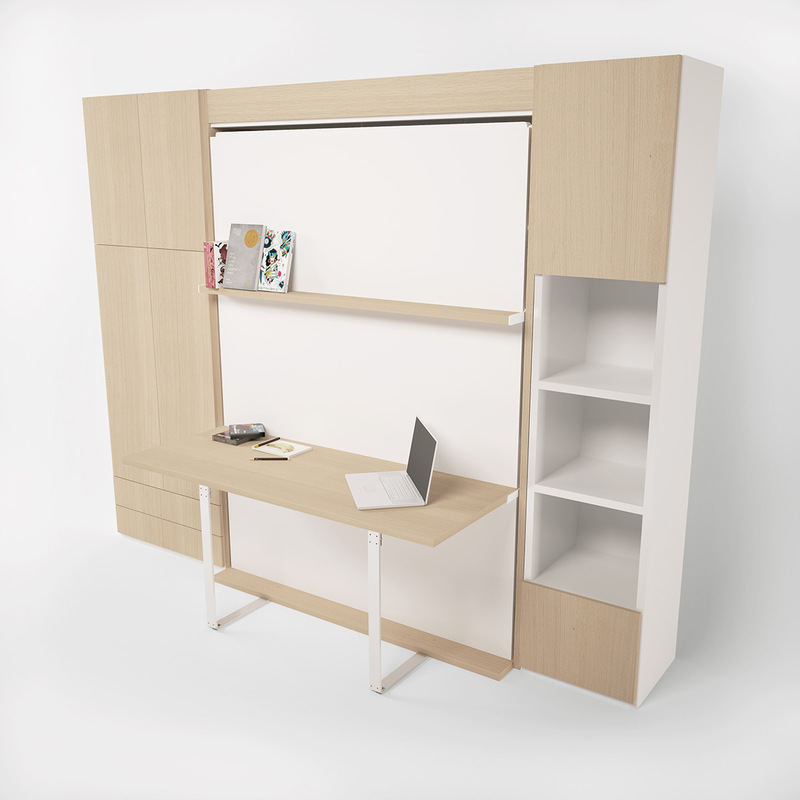 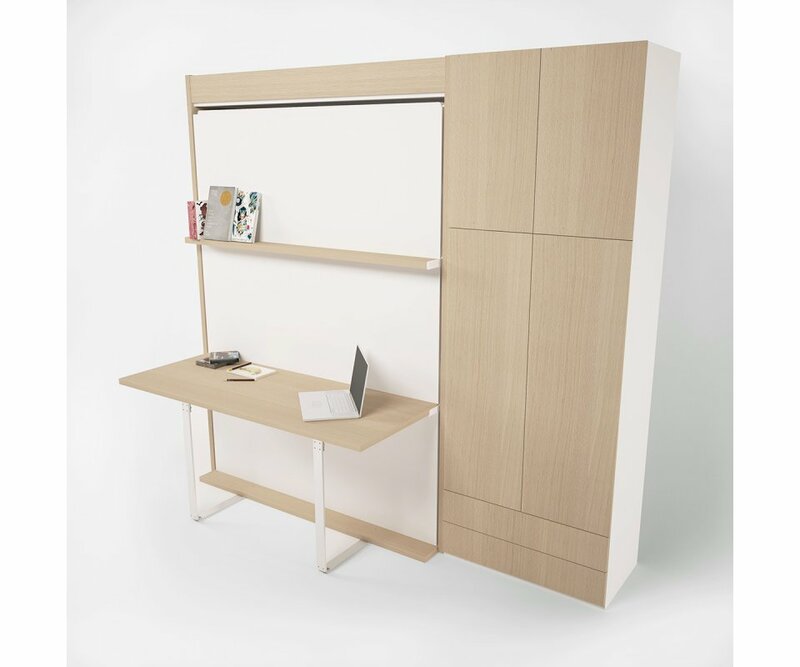 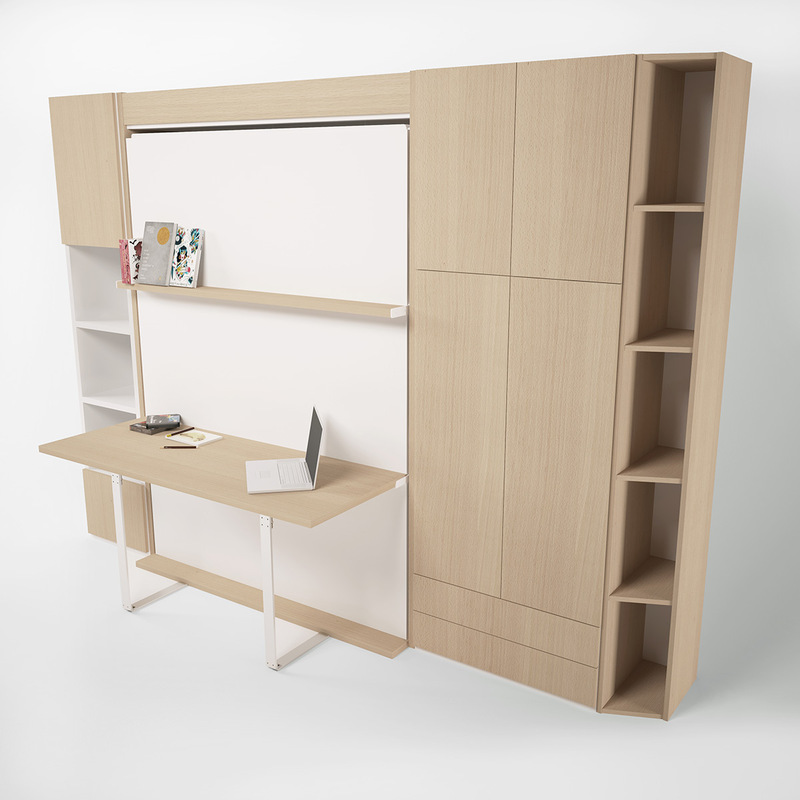 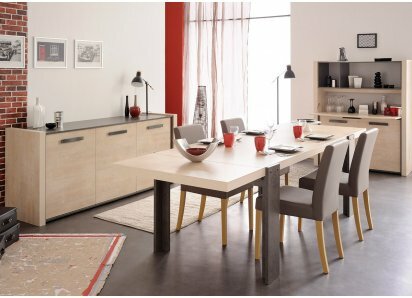 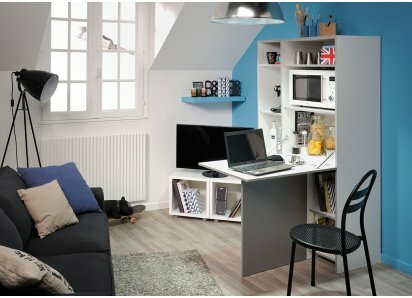 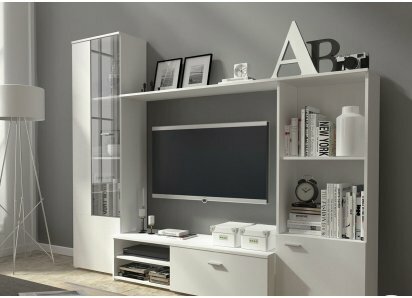 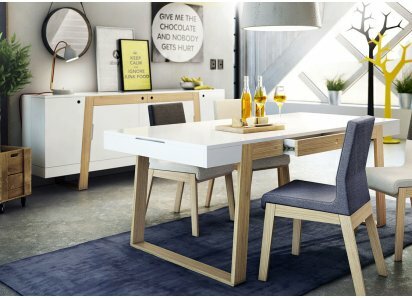 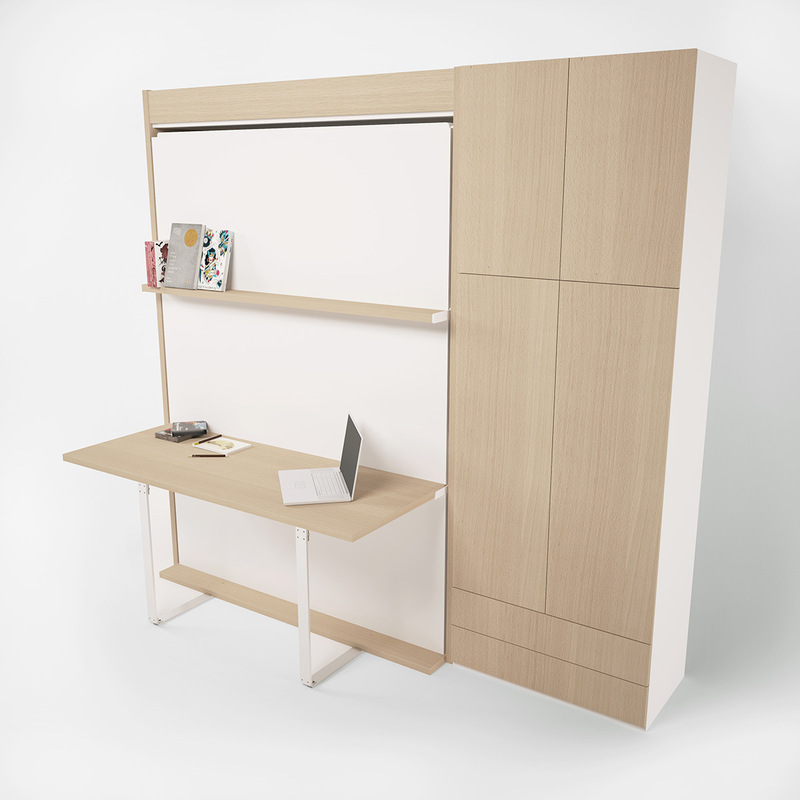 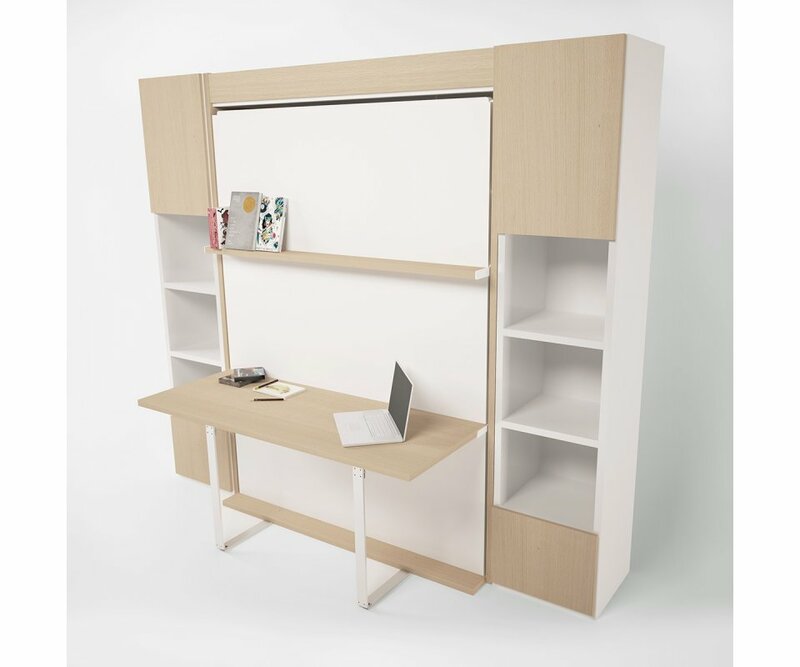 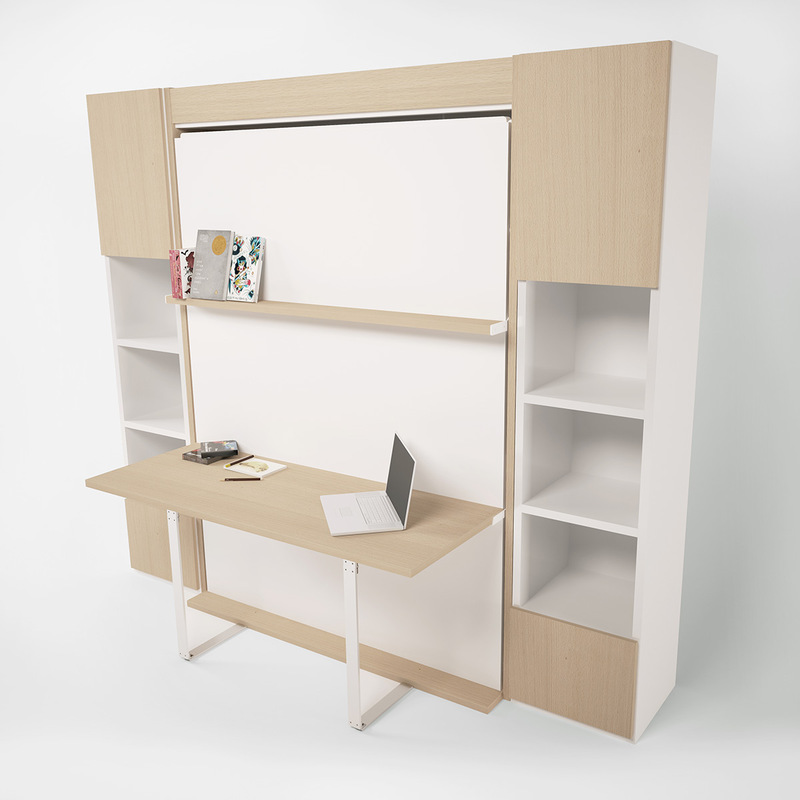 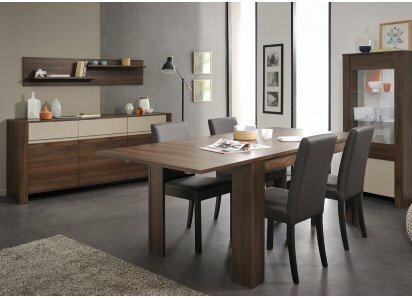 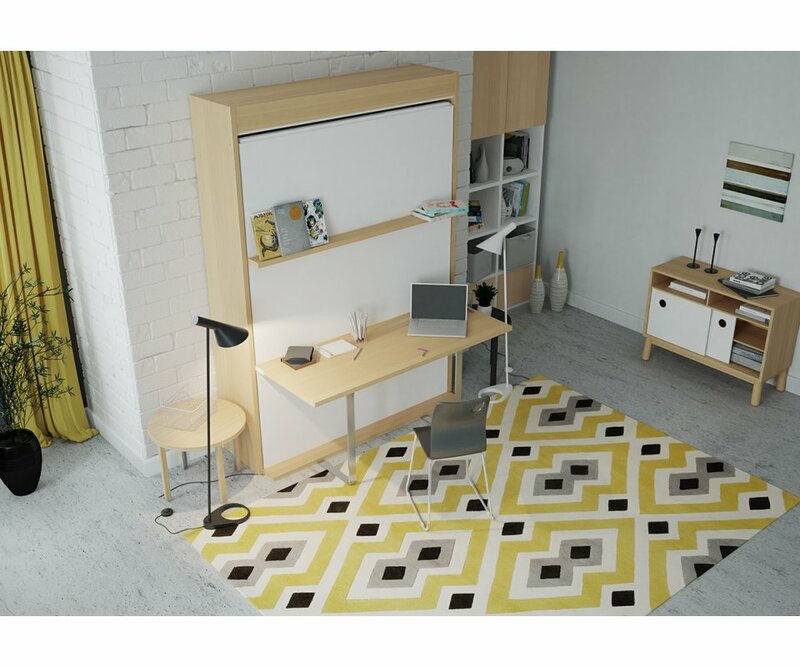 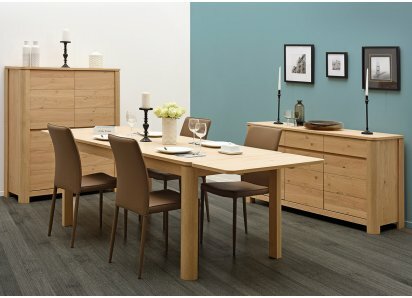 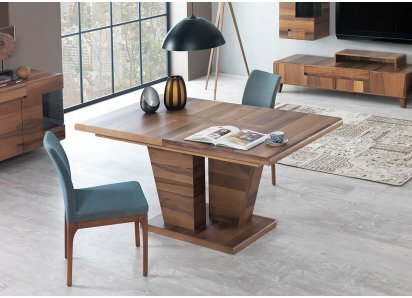 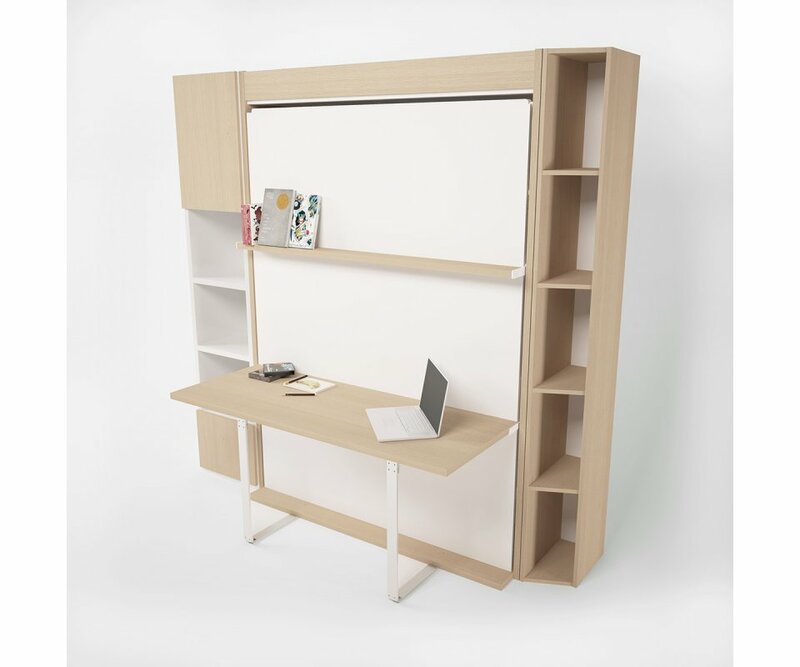 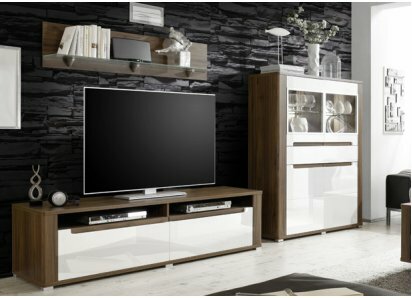 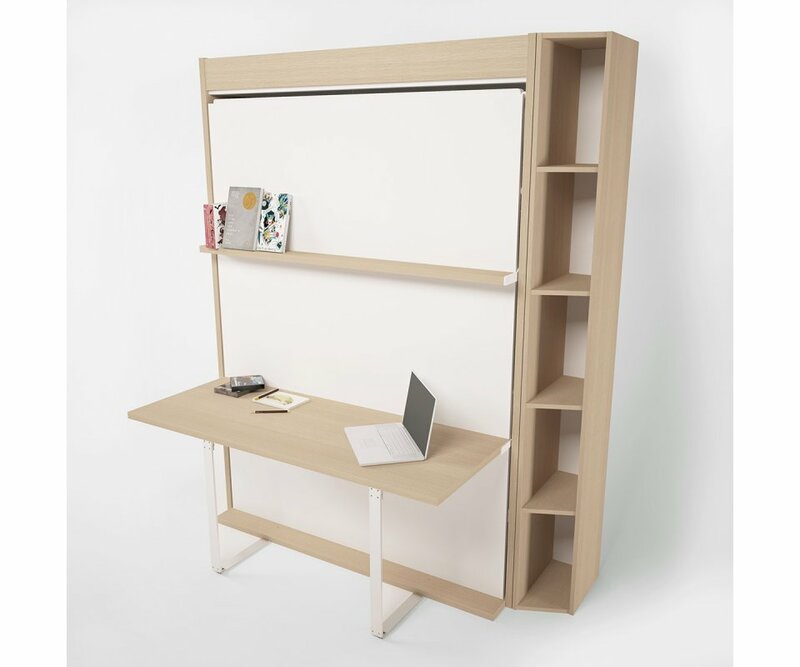 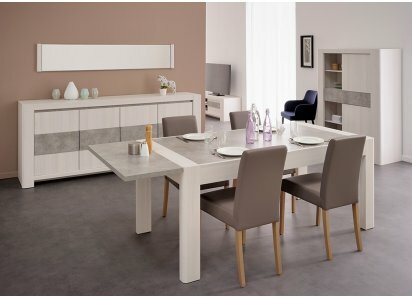 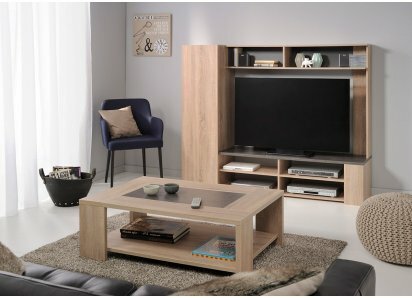 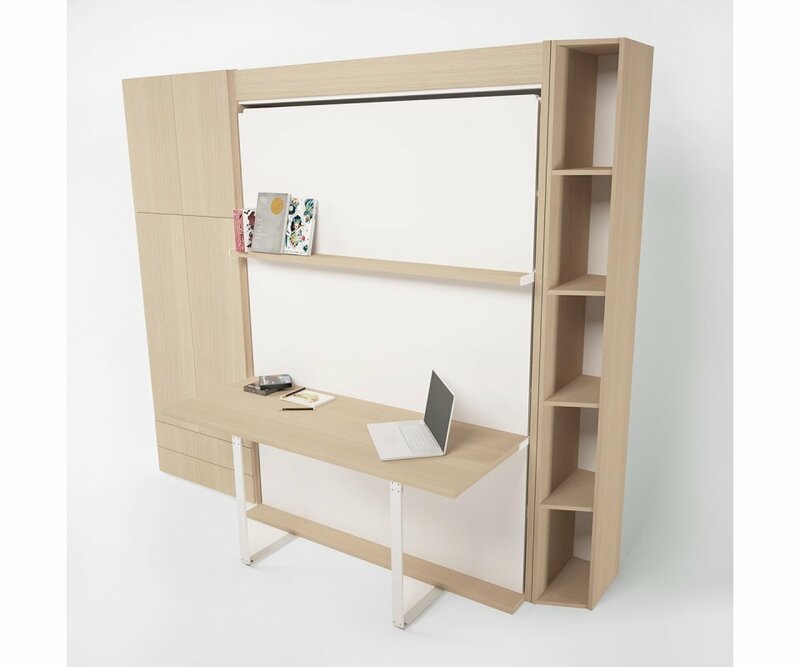 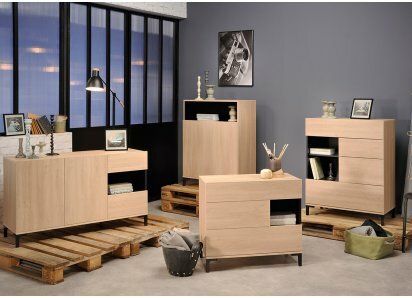 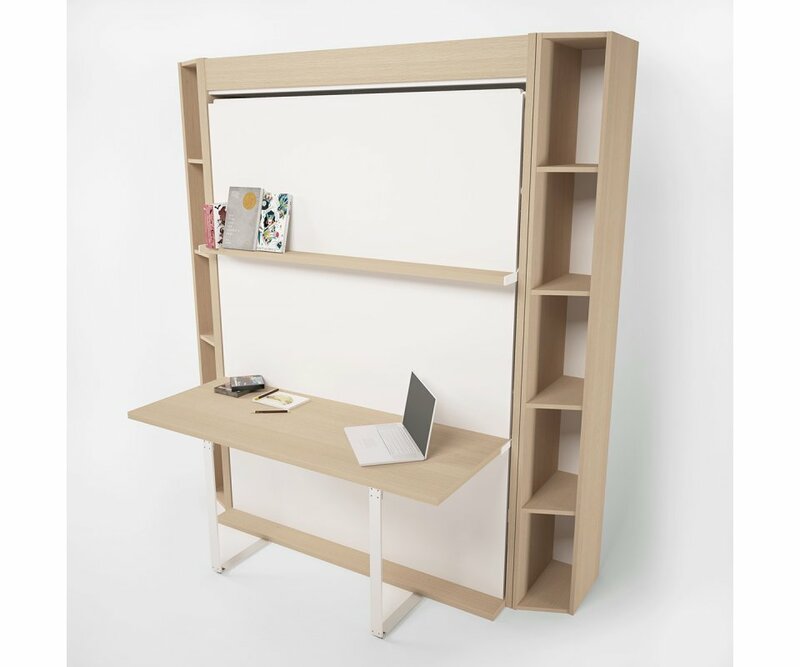 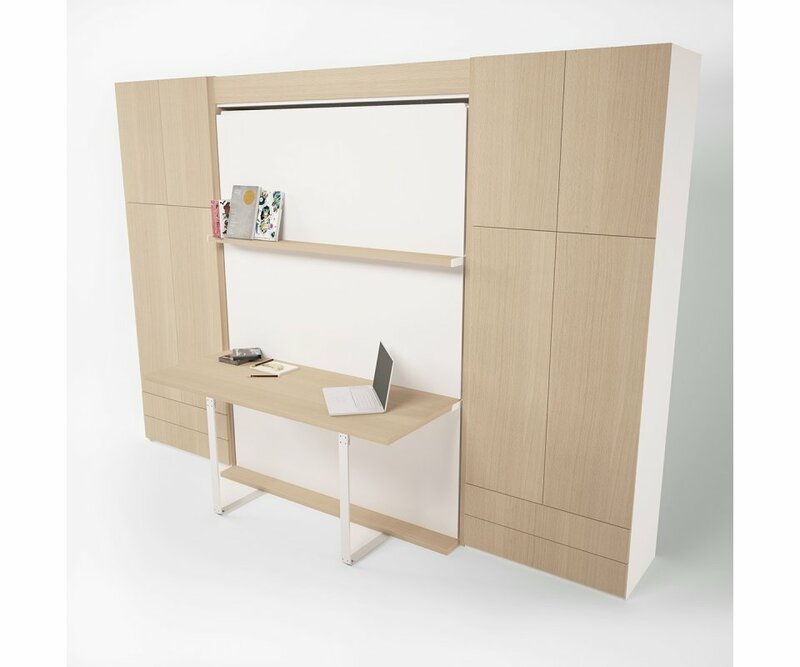 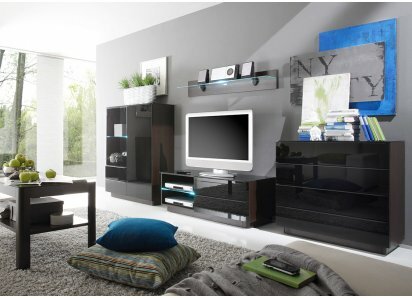 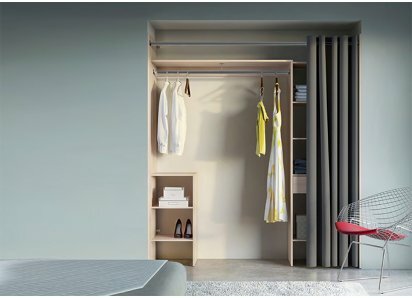 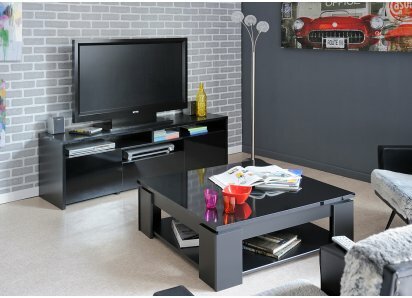 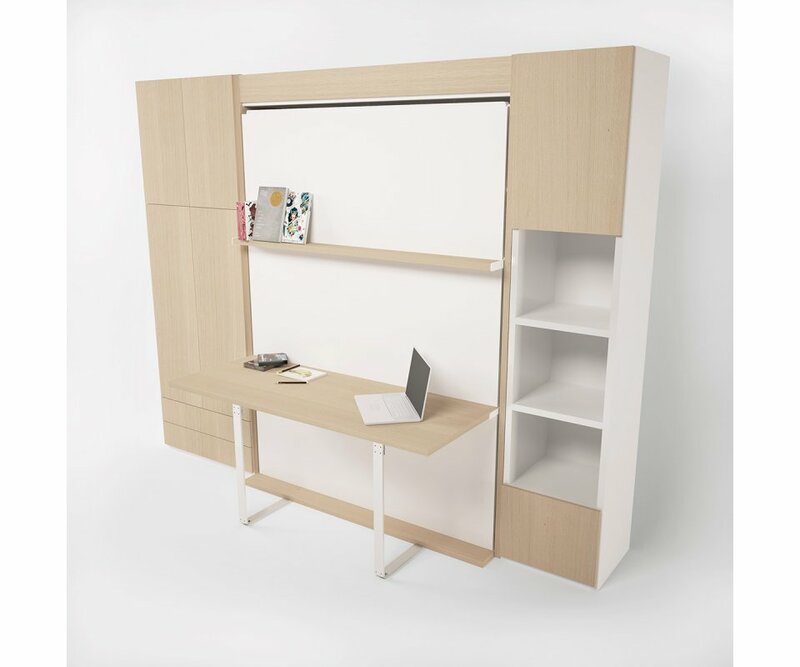 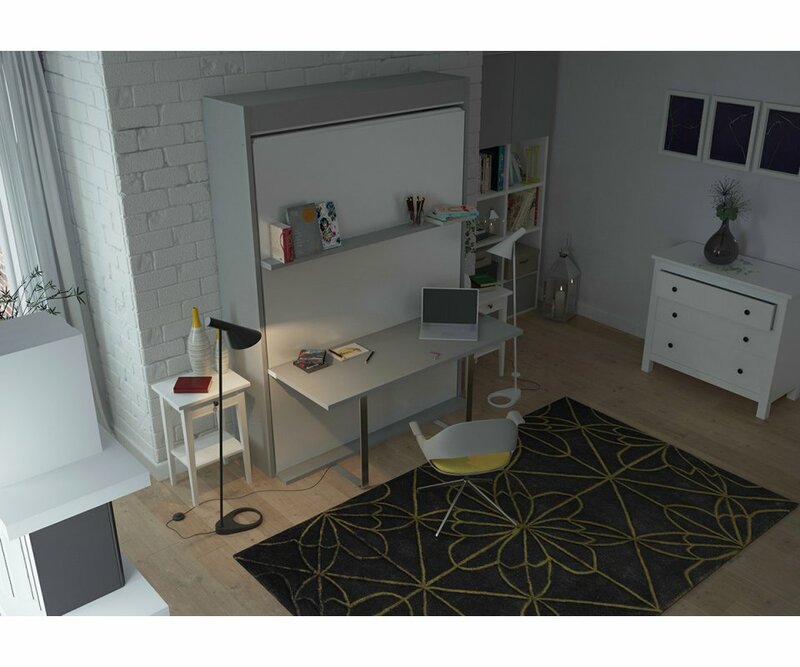 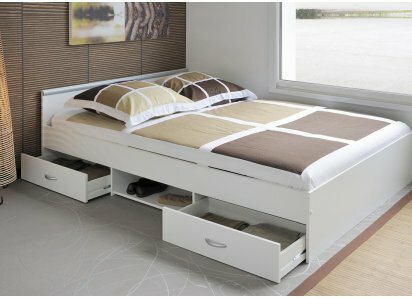 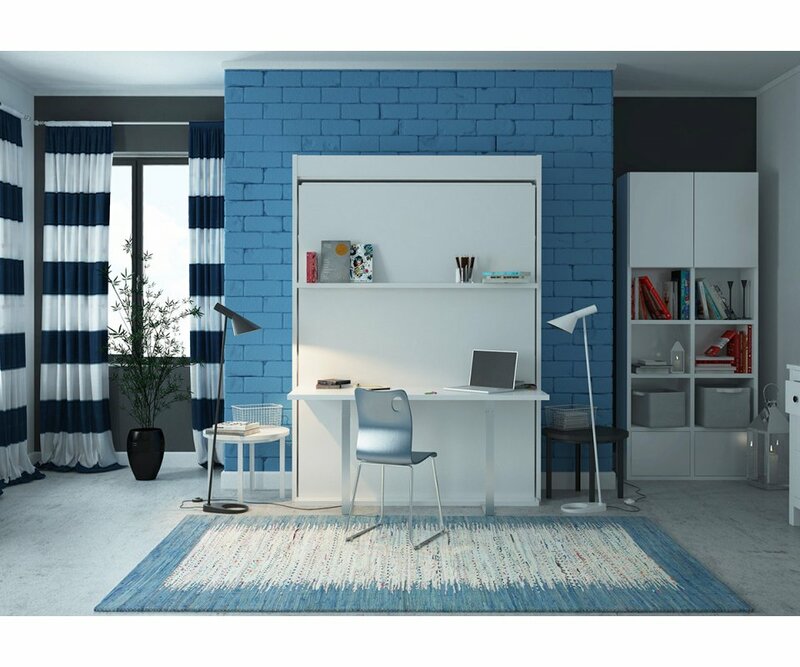 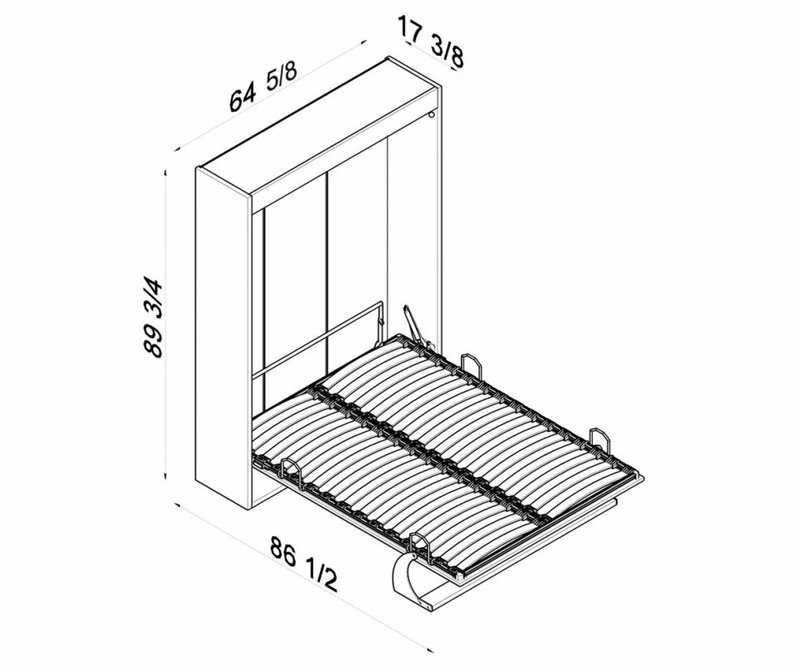 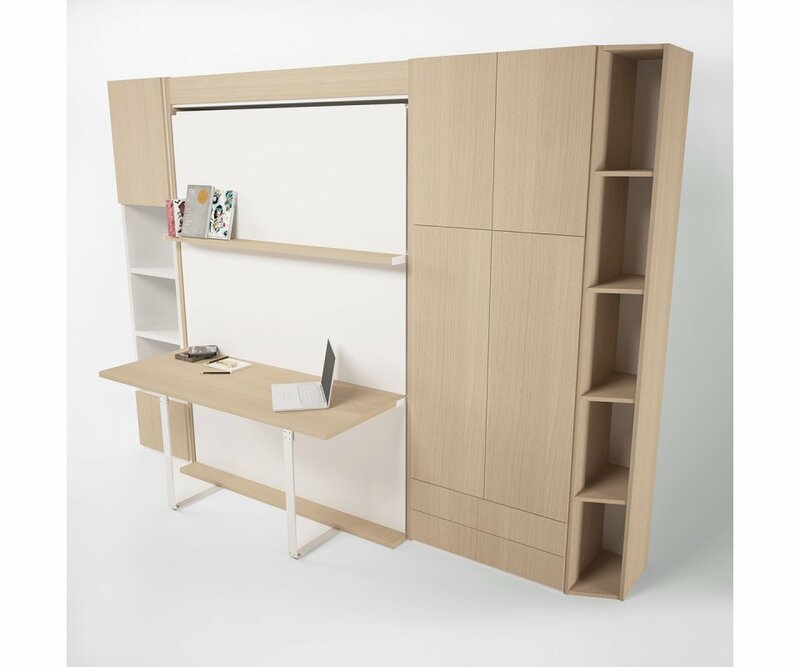 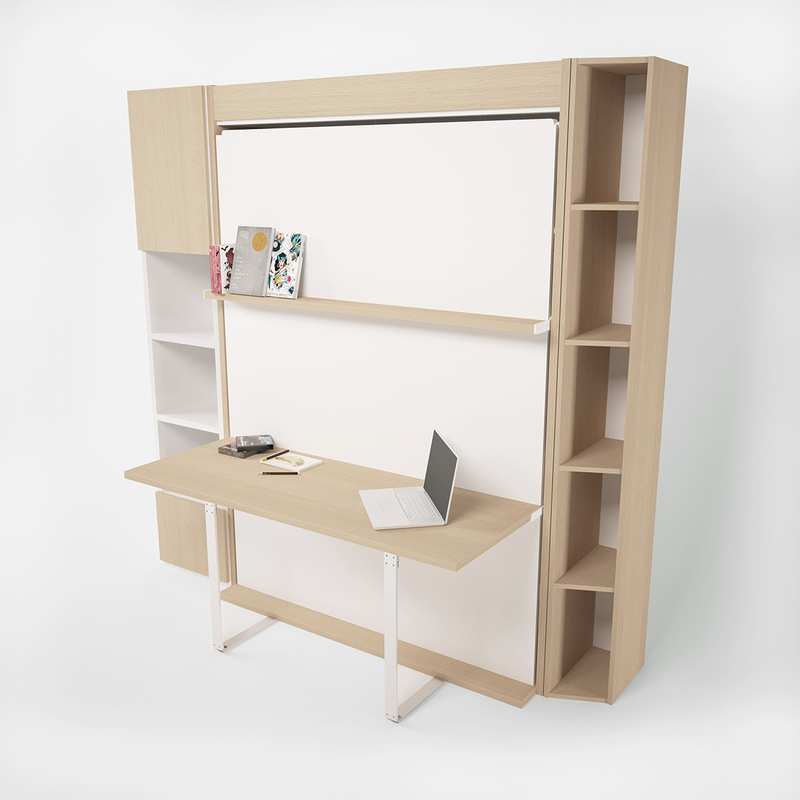 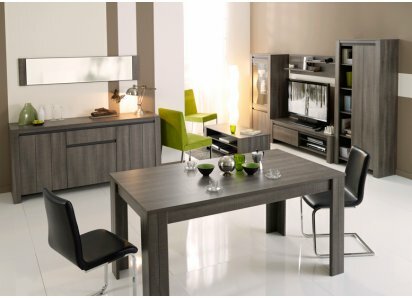 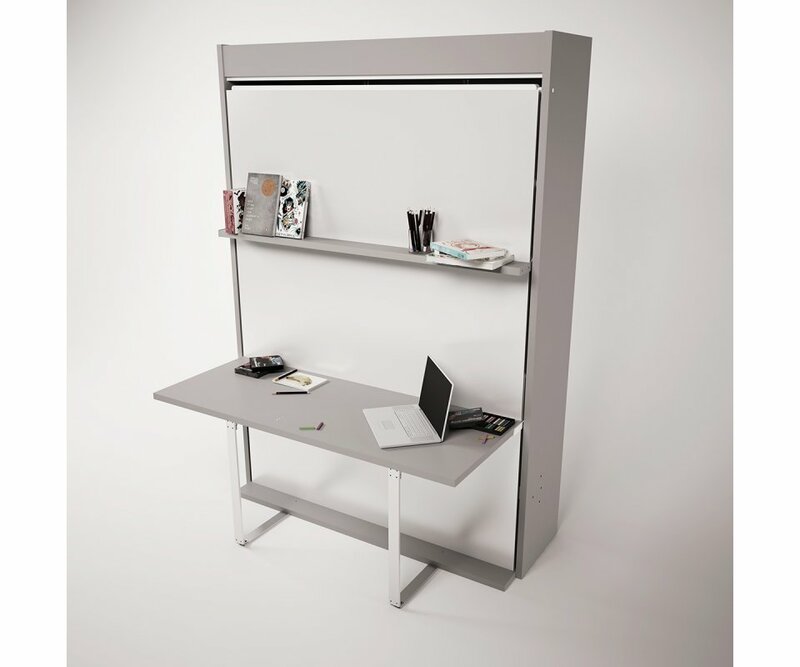 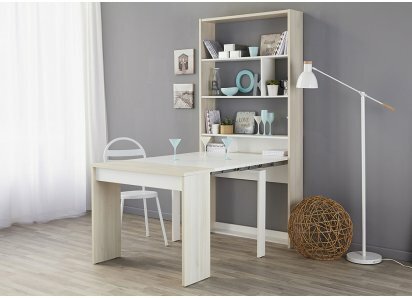 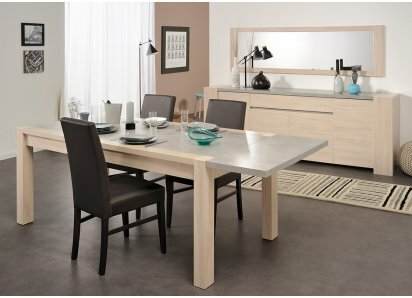 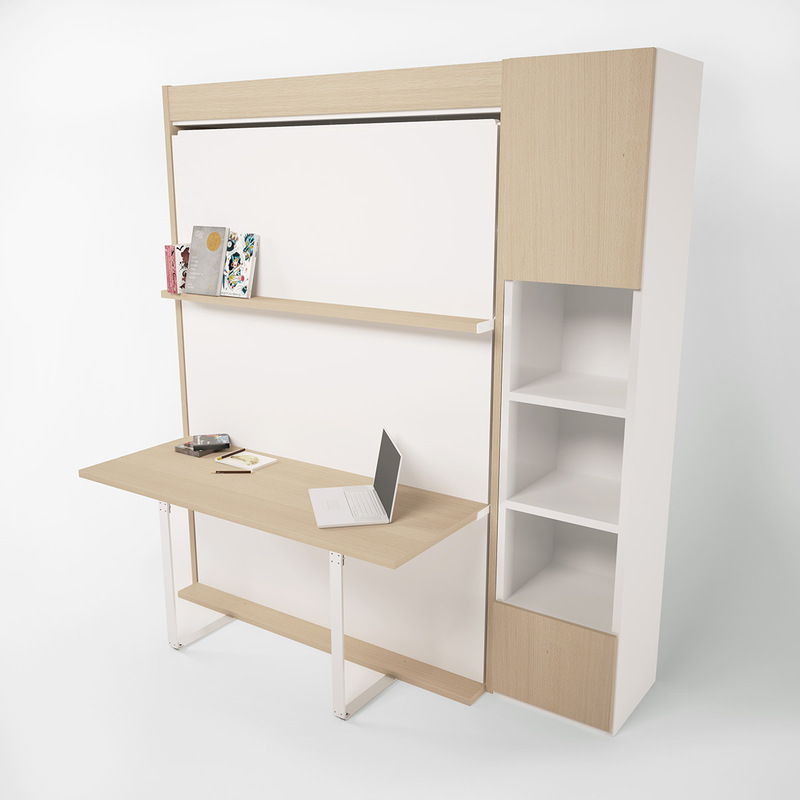 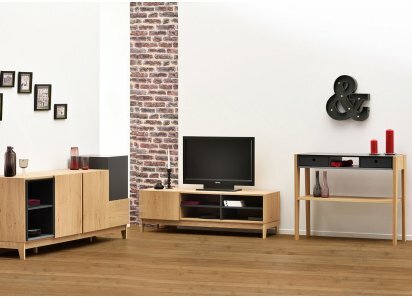 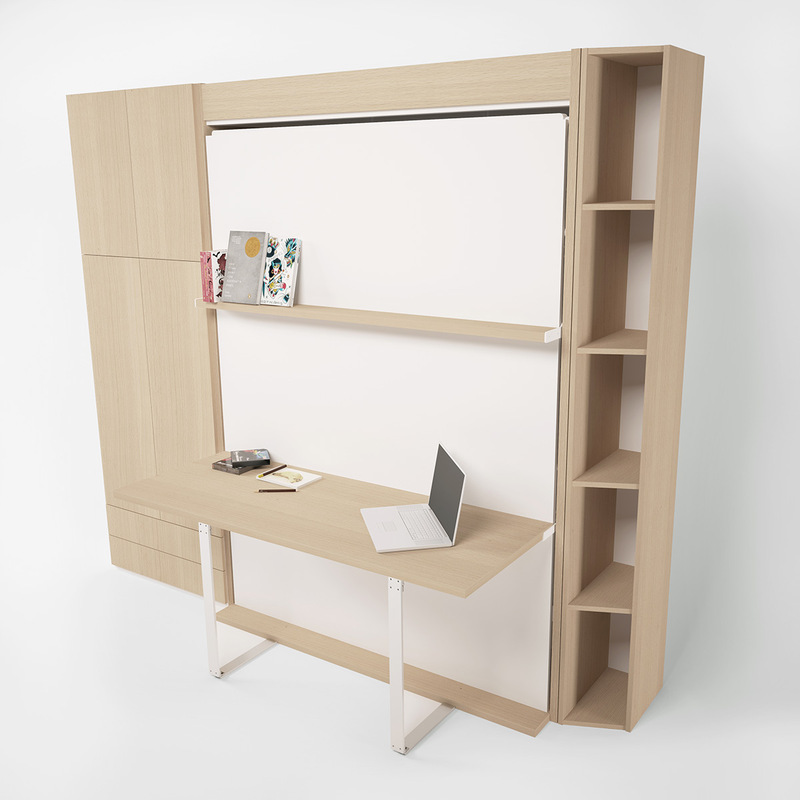 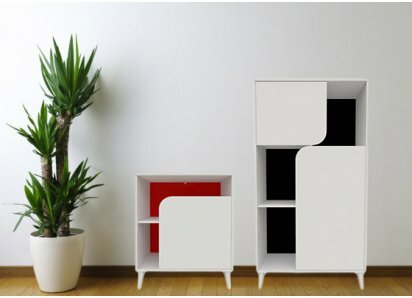 • Multifunctional transformation, ergonomic and compact (shelf, wall bed, table). 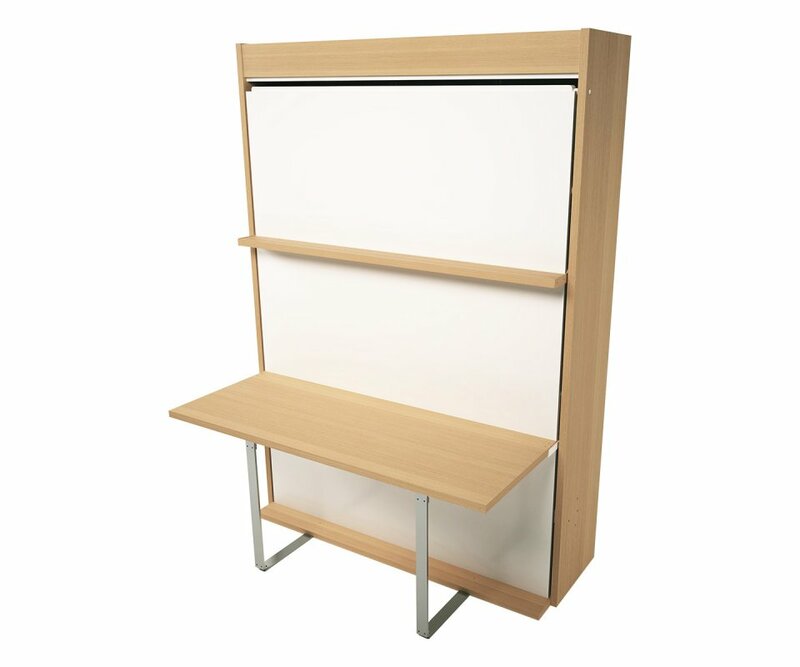 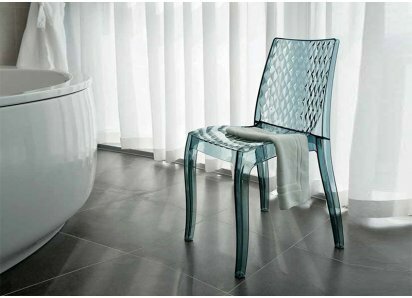 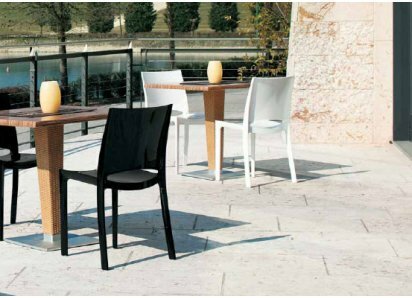 • Technical design appropriate to TUV GS (European) standards, including security, health and ergonomics.